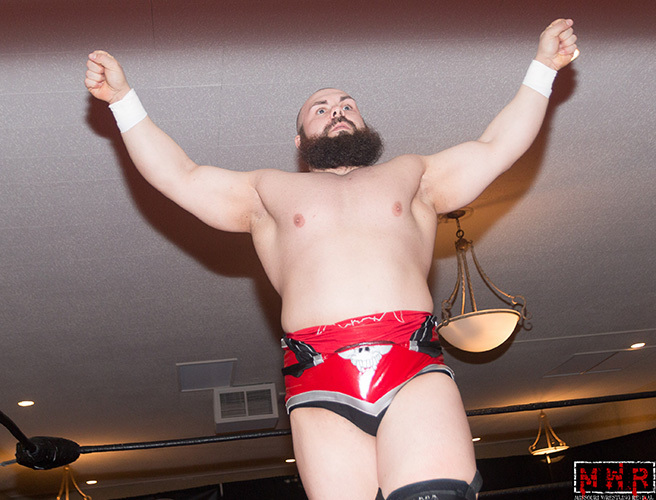 Trained by former Ring of Honor World Champion Michael Elgin, Danny Adams and Paco Gonzalez, came together to form the tag team Alpha Class and quietly picked up huge wins in 2016. 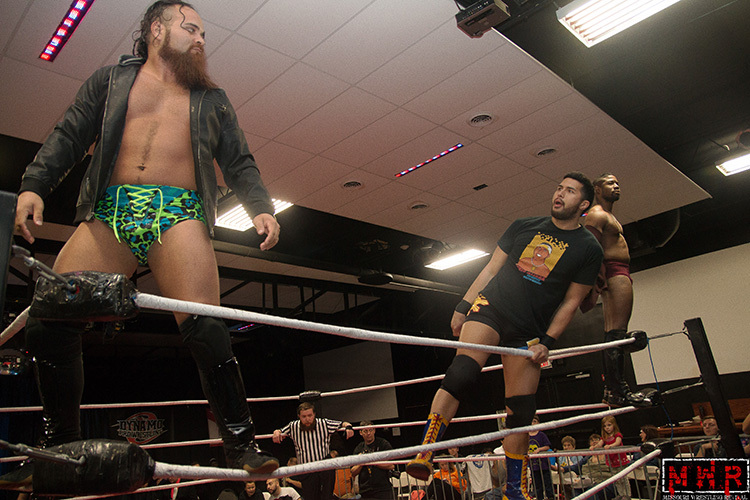 In January, the duo picked up a big win against former Dynamo Pro Wrestling Tag Team Champions Shawn Santel and Mauler McDarby otherwise known as the Professionals. 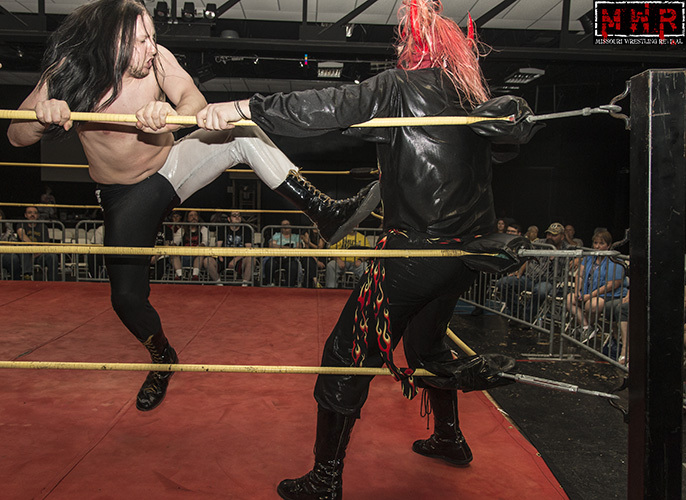 They would challenge the DPW Champions High Level Enterprise, Jon Webb and Jack Gamble coming up just a little short, but that would not deter them in the least. 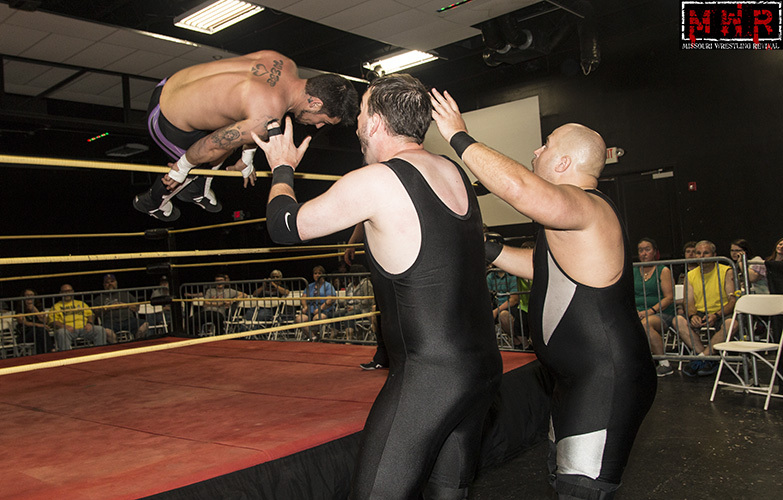 While making their way to Proving Ground Pro they picked up a huge win by defeating the much larger and powerful team of Blake Belakis and Nate Redwing, while backing that up with a win against Craig Mitchell & Kenny Sutra. 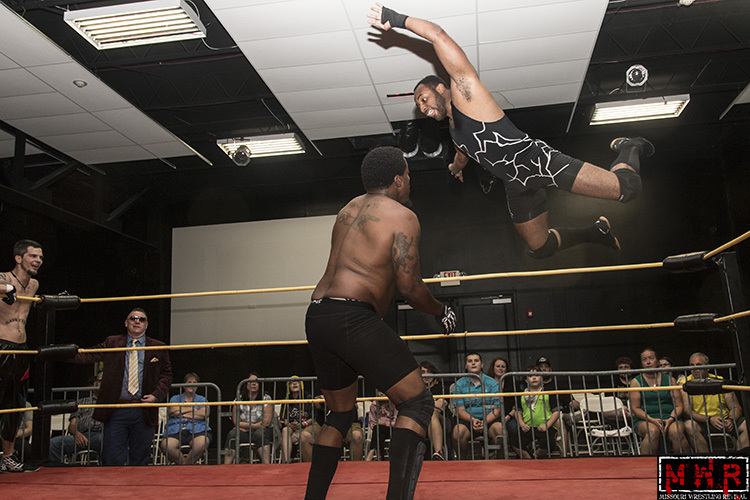 In August at Pro Wrestling Resurgence Alpha Class picked up a an epic win against two of the most successful tag teams in the Midwest in a triple threat match with The Submission Squad(Evan Gelistico & Pierre Abernathy) and 2.0 (A.J. Williams & Da’Marius Jones). 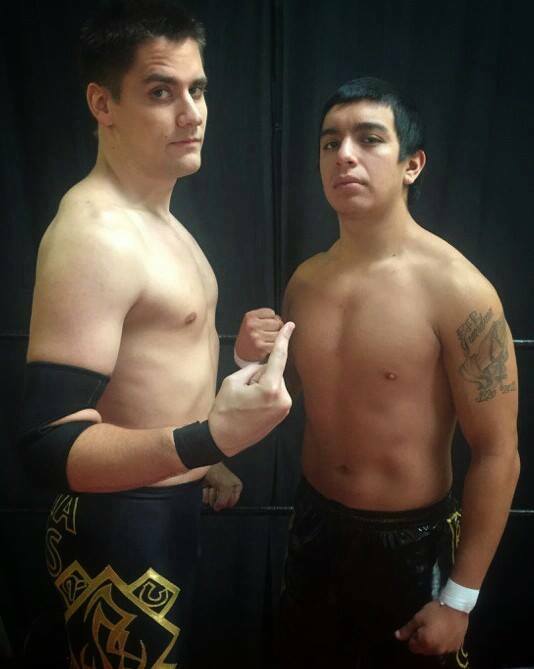 Proving that that win was not a fluke Alpha Class upset the Besties in the World, Davey Vega and Mat Fitchett. 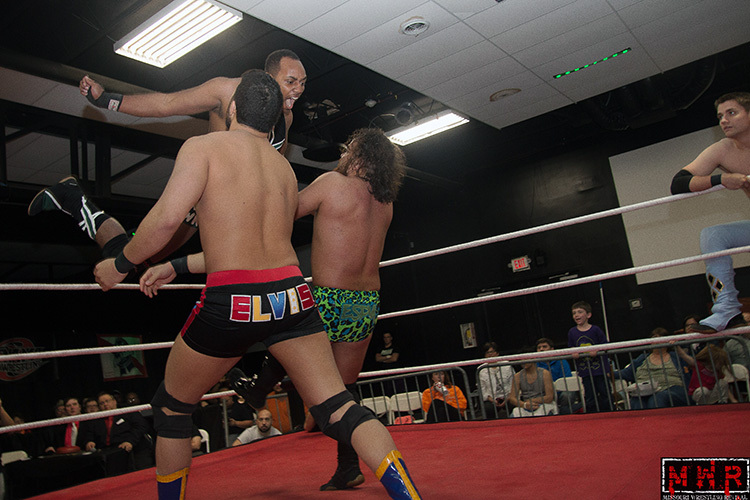 Less than a month later they not only defeated The Carnivore Club (Blake Belakis & Nate Redwing) to win the Proving Ground Pro Tag Titles, but successfully defeated them in a rematch for the title. 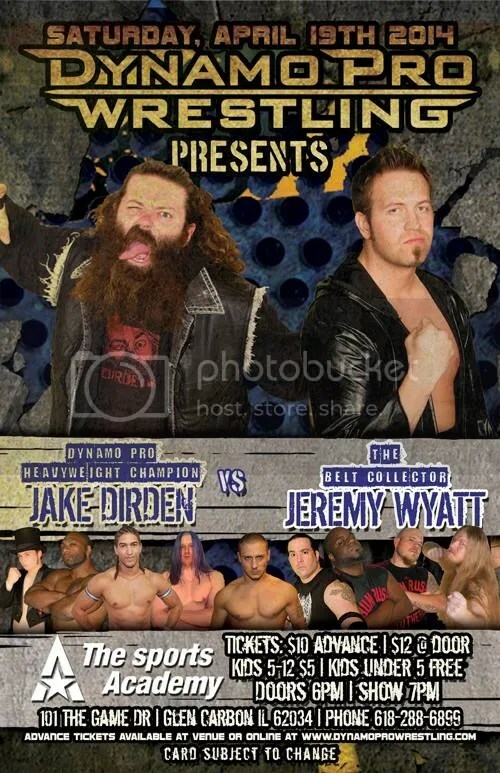 Back in St. Louis for Dynamo Pro Wrestling they would lose a hard fought title match against Straps Down University (Keon Option & Justin D’Air) before returning back to Proving Ground Pro to retain the titles against the Brother Reed & Micky Muscles. 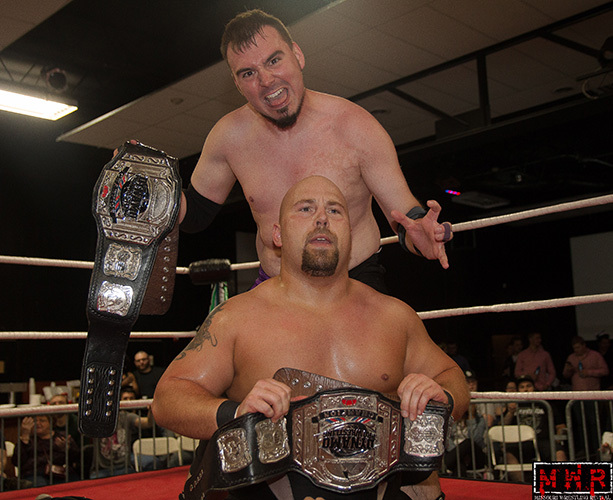 In the month of November they would retain their PGP Tag titles against the 3-time MWR Tag Team of the Year recipients Devin and Mason Cutter, the Hooligans. 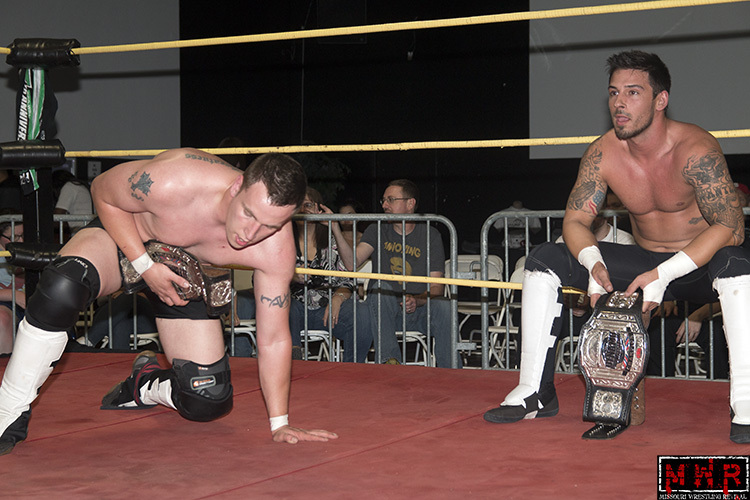 Danny Adams and Paco Gonzalez proved that with great training, hard work and dedication they have a bright future and start the year off as Proving Ground Pro Wrestling Tag Team Champions but now they also lay claim as the 2016 MWR Tag Team of the Year. Look for an exclusive MWR Tag Team of the Year Alpha Class artwork honoring her for their achievement from acclaimed artist Dartallion Allen Jr. in the future. 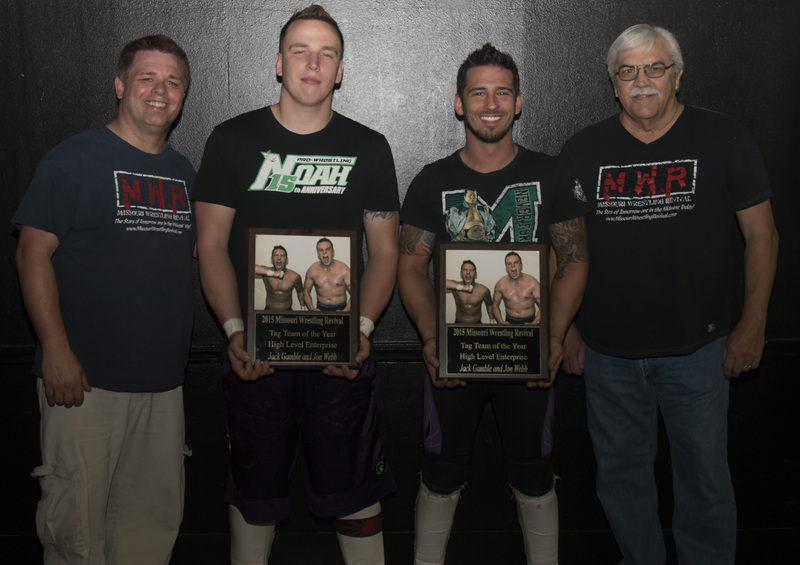 If you would like to sponsor the MWR Tag Team of the Year Plaques for Alpha Class then please contact MWR at flairwhoooooo@yahoo.com. The cost is $100.00 (two plaques) and you will receive a past MWR Yearbook, a Tyler Black (Seth Rollins rookie card) and a mention on the MWR Website. The show started with Brian Kelley presenting the 2015 Missouri Wrestling Revival Tag Team Of The Year plaques with sponsor Jack Tierney to High Level Enterprise(Jack Gamble & Jon Webb). 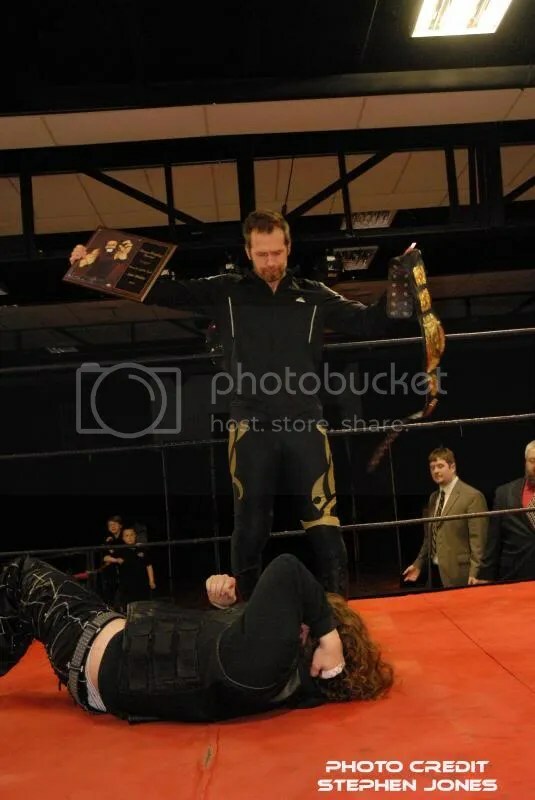 The ceremony was interrupted by The Professionals(Shawn Santel & Mauler McDarby), who used underhanded tactics to beat HLE for the Tag Team Titles at the April show…they said the awards were nice but the title belts were even better. Of course, it would be a real downer for HLE to win those awards and then fall short in their return match for the belts…but we’ll get to that later. Rocket Mapache vs. C.J. 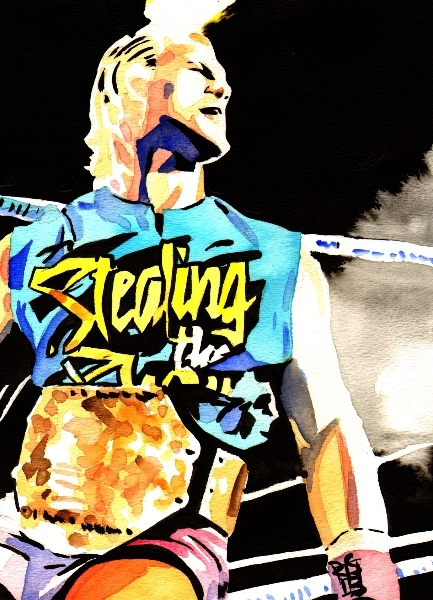 Shine: Shine faced fan favorites in both of his matches on Saturday…I don’t know if that means he’s being positioned as an eventual rulebreaker, but time will tell how the fans react to his character. It was a quick competitive matchup, ending with Rocket avoiding a kick and getting the rollup pin in 4:00. 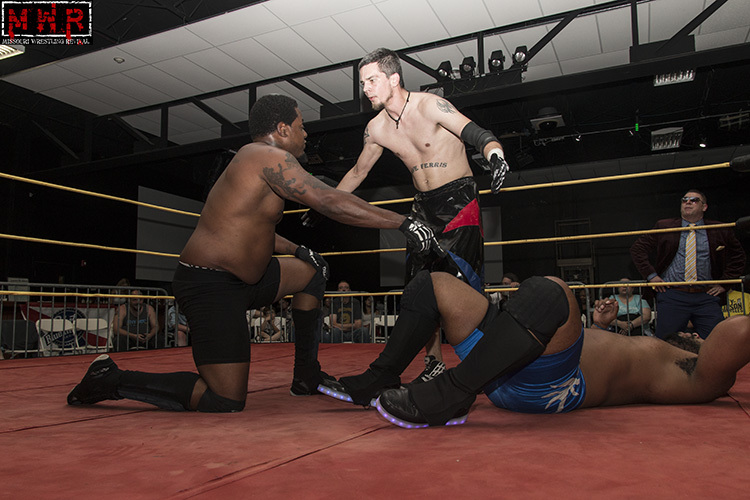 “The Valedictorian” Keon Option & Justin D’Air vs. Billy McNeil & Jayson Khaos(w/ C.J. McManus): The fan support was divided in this one as Option & D’Air are popular, but so is Billy McNeil. 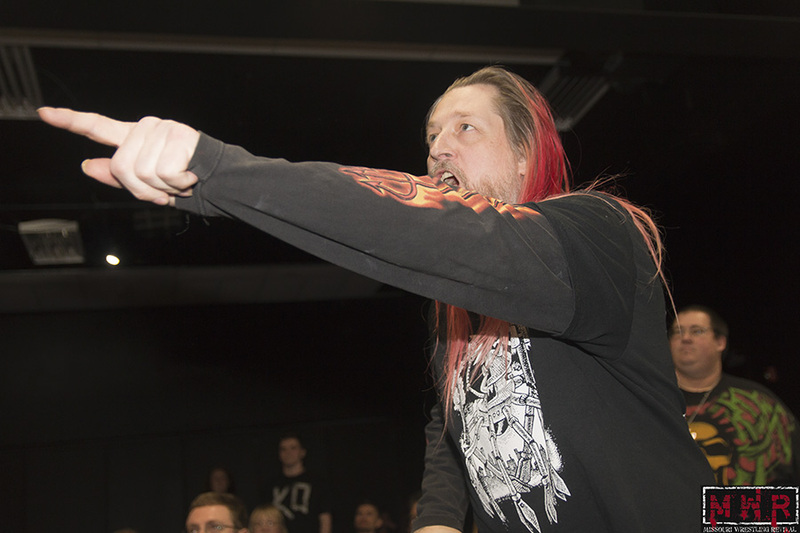 The story of the match was the dissension between the Midnight Society members as Khaos and McManus wanted to break the rules and McNeil did not. The tension turned into a full-blown argument by the end of the match as they could have gotten the win over D’Air but lost focus. 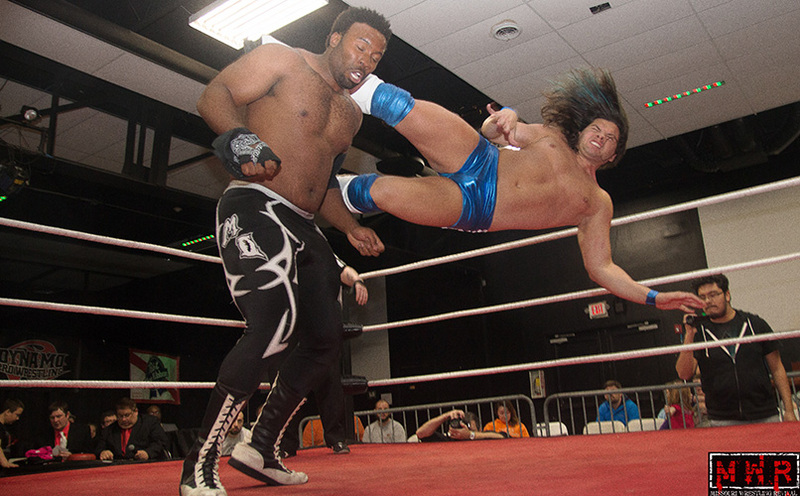 Option took the opportunity to jump in the ring and blitz Khaos with a series of moves, ending in an axe kick that led to D’Air scoring the three-count in 13:00. The Society totally fell apart after the bell as McNeil shoved C.J. 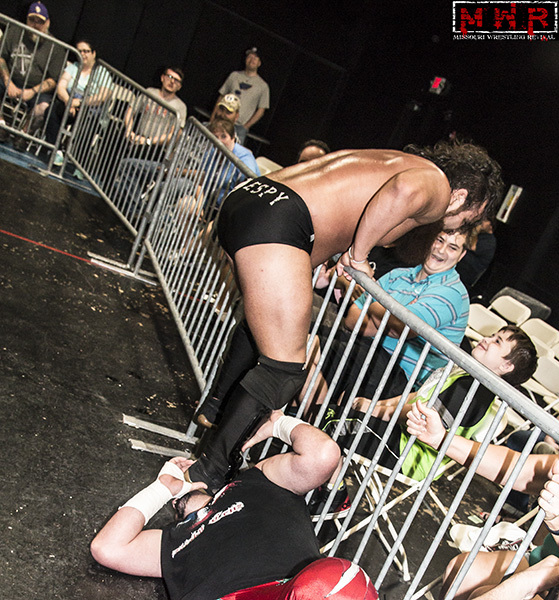 to the mat and picked up a chair on his way out of the ring…but the sides parted ways without further incident. Outtkast vs. Kiyoshi Shizuka(w/ Lucy Mendez) for the D-1 Title: Shizuka traded wins with Outtkast’s tag team partner Shorty Biggs in recent months. While Lucy has her share of…admirers, I’ll say…she does really well in her role as a rulebreaking manager. I’ve commented a lot on my desire for more women’s wrestling in this area; hopefully the wheels are in motion for that to happen soon. I don’t know much about the masked newcomer Shizuka, but he’s had solid matches in his handful of in-ring appearances. Lucy was nearly a factor in the outcome as she caused a distraction, allowing Shizuka to hit Outtkast with his Japanese flag pole behind the referee’s back. 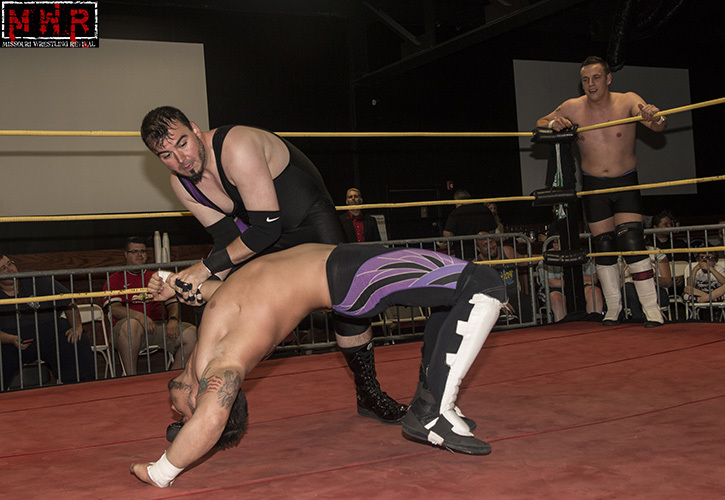 He followed up with a Perfectplex, but Outtkast barely kicked out before the three-count. The masked challenger set up to finish with a brainbuster, but Outtkast small-packaged him for the flash pin in 12:21 to retain his title. 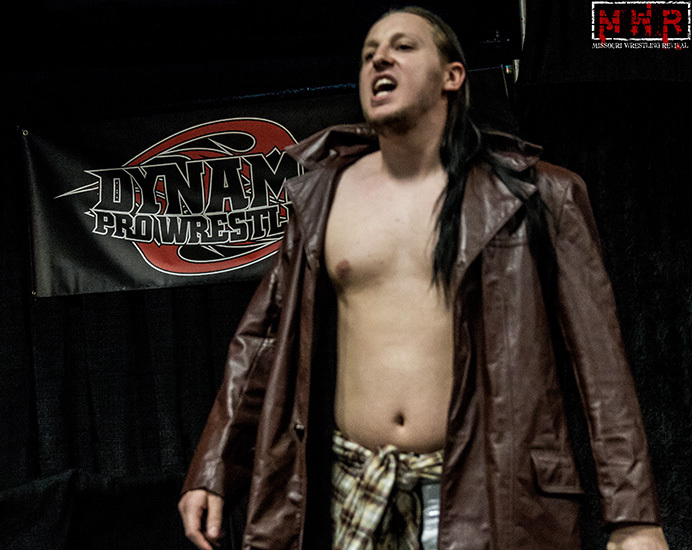 Makaze vs. “The Alternative” Ozzie Gallagher: Sadie Blaze made a surprise return to Dynamo Pro a few months ago and immediately had issues with his former student Gallagher over his underhanded tactics. 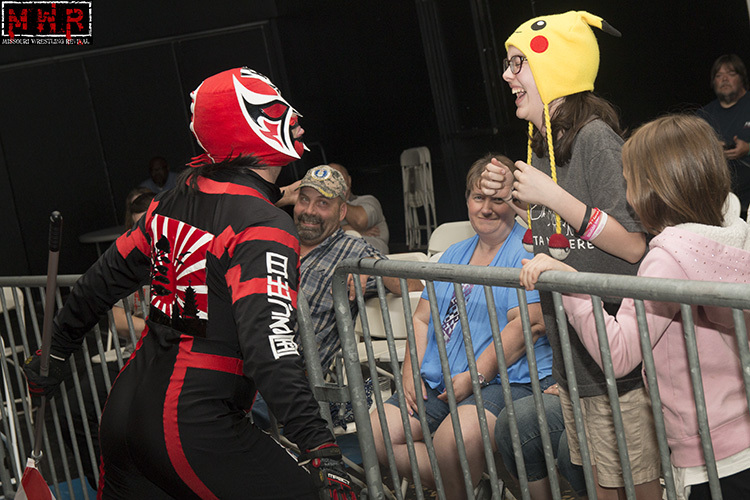 He especially took issue with Gallagher’s disrespect toward masked wrestlers like Rocket, which is understandable given his masked alter-ego Makaze. 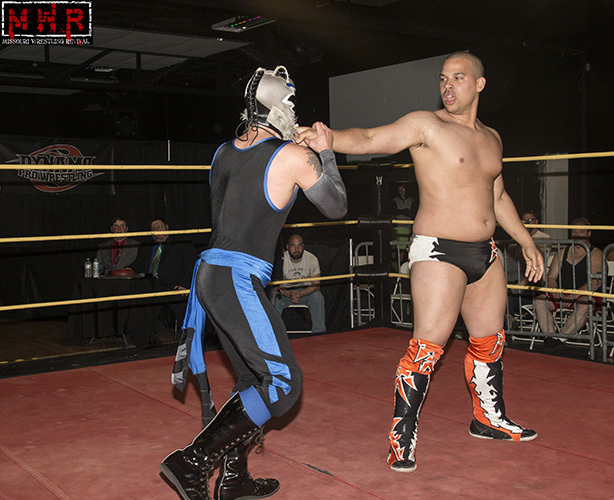 Gallagher stole Rocket’s mask on one occasion and kept trying to swipe it again after Rocket reclaimed it; that finally drove Blaze to take matters into his own hands and bring “Makaze” back into action. Makaze’s one of the only guys from the first independent show I attended(in the spring of 2000) who’s still working today. 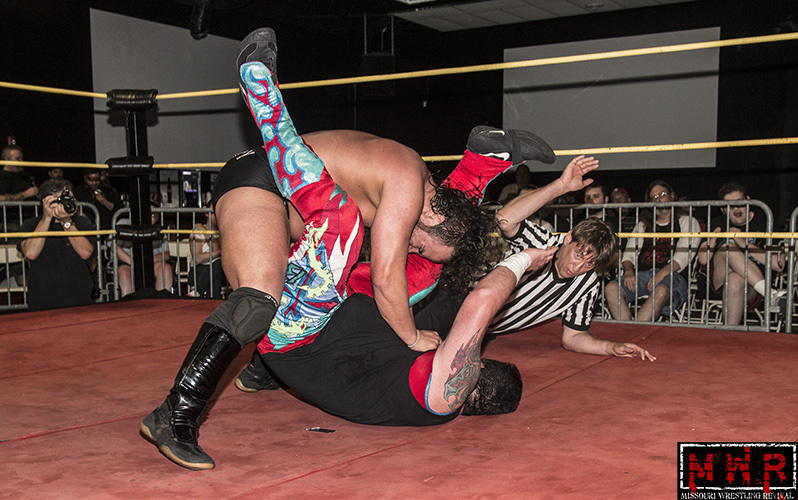 The match itself was solid as a first chapter in the series…a near-ref bump allowed Gallagher to deliver a punt to the Universal Weak Point, then roll him up in a modified Oklahoma roll for the cheap pin in 8:40. I somehow suspect that this issue is not quite over, regardless of Gallagher’s sentiment on the matter. 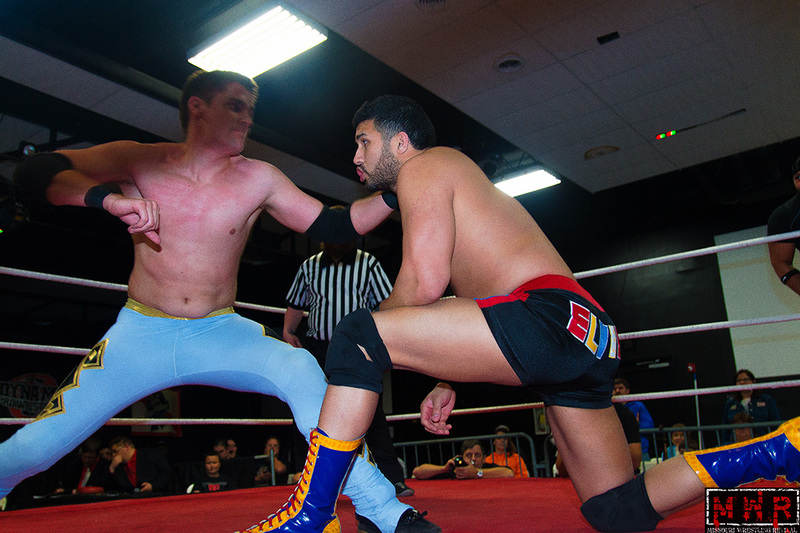 “The Millenial” Danny Adams vs. “The Filipino Warrior” Elvis Aliaga(w/ Lucy Mendez): Good heel wrestlers can take some time to appreciate and I feel like I’ve turned that corner with regards to Aliaga; he’s very underrated. Adams has proven his versatility in recent months as I’ve seen him work in both the fan favorite and rulebreaking roles. They had a really good matchup and Lucy got involved on more than one occasion…that led to Elvis rolling him up for the pin with feet on the ropes in 11:04. 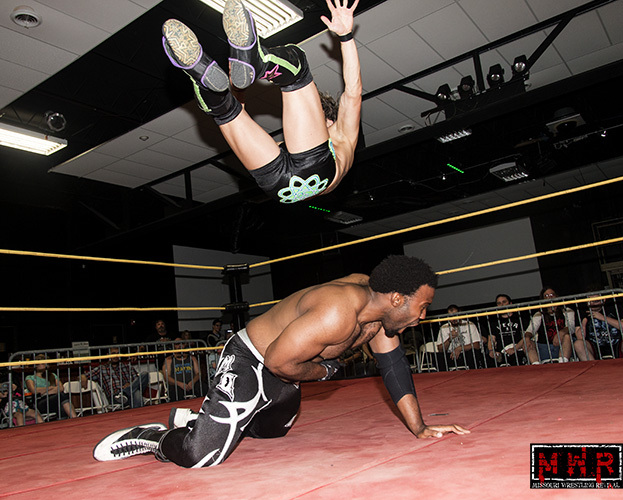 Mike Outlaw vs. “The Yoga Monster” Mike Sydal: These two nearly crossed paths a while back as Outlaw and Justin D’Air had been scheduled to face Mike and his brother Matt, but Matt’s travel issues ixnayed that potential bout. 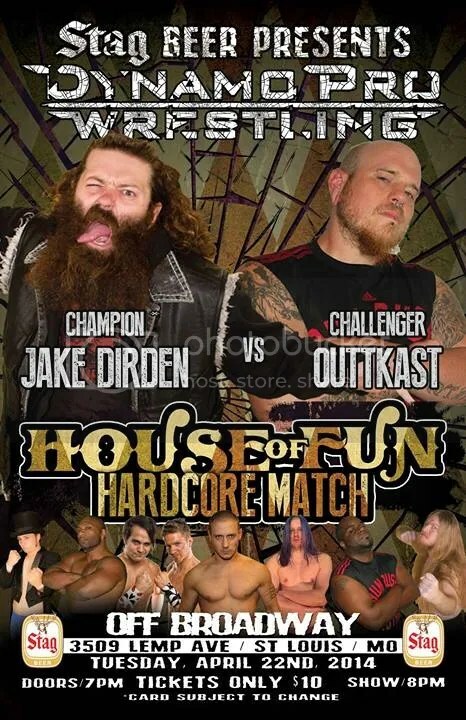 This was a battle of fan favorites and a good one; I’ll never quite understand why Ring Of Honor didn’t do more with Sydal. I joked that my money was on Mike to win this match and at least one fan tried to start a “Let’s Go Mike” chant…MARKET CONFUSION~! 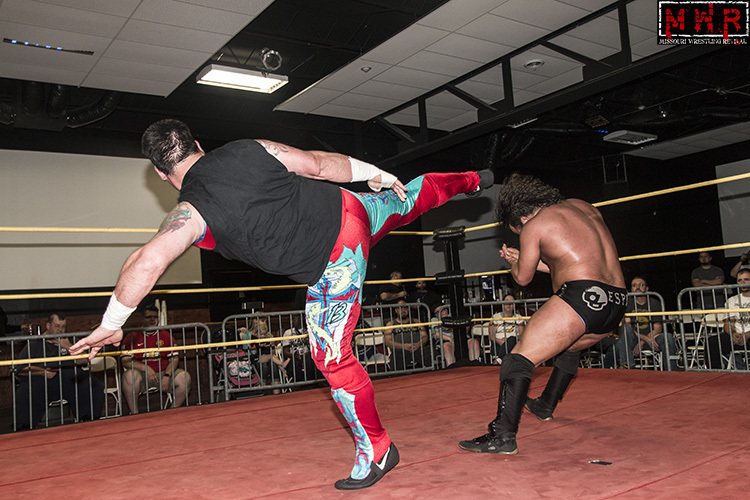 Sydal made the fatal mistake of dropping his yoga mat and going out to retrieve it for the sake of his Yogasault…Outlaw had enough time to roll out of the way of the move, then finished with the Mafia Kick in 12:23. Nicely done. 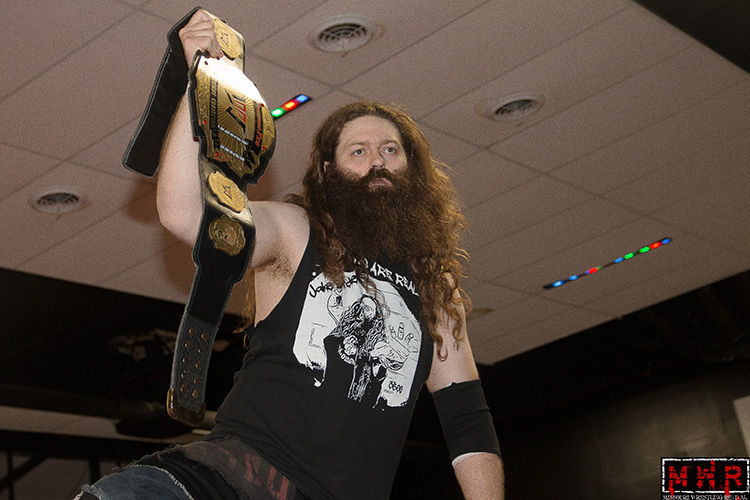 Post-match, Outlaw acknowledged Dirden’s absence and said he hadn’t had a fair rematch for the title since losing it in May of the previous year. He said that he wanted his title shot…and if Dirden wouldn’t give it to him, then he would stay on his trail until he got it. Glad to see he’s getting back into the title hunt…woo. 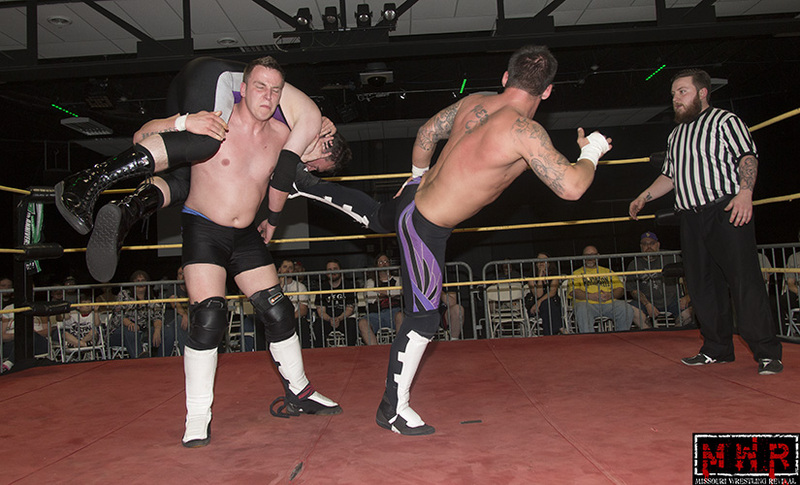 The Professionals(Shawn Santel & Mauler McDarby) vs. High Level Enterprise(Jack Gamble & Jon Webb) for the Tag Team Titles: As noted, Santel & McDarby had captured the belts under dubious circumstances in April; this was the rematch. I think these teams are good foils for each other and I hope the series will continue after this point. Option & D’Air watched the match from ringside and seem to be positioned as future challengers. There’s also the possibility of the Black Hand Warriors re-entering the championship picture, not to mention the Midnight Society in whatever form it may take. The finish saw HLE isolate McDarby; Gamble picked up McDarby on his shoulders and held him for a superkick from Webb, then delivered a fireman’s-carry Michinoku Driver for the winning fall in 13:12…Gamble & Webb are now two-time Dynamo Pro Tag Team Champions! 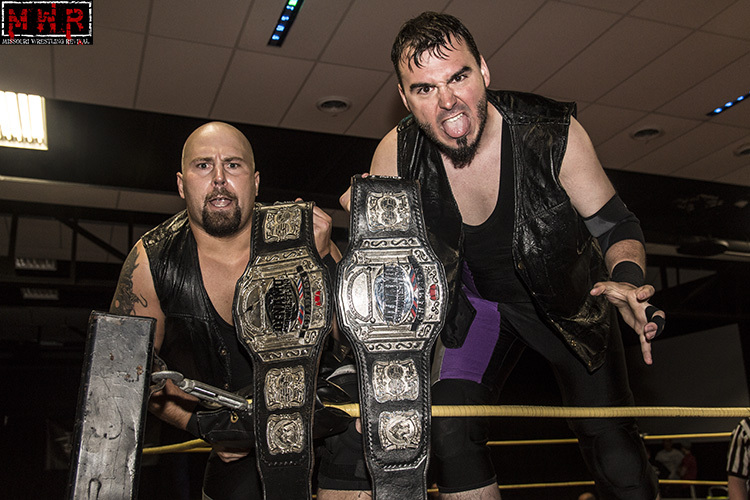 Option & D’Air made a point to hand the belts to the new champions…just like that, the hunters are once again the hunted. 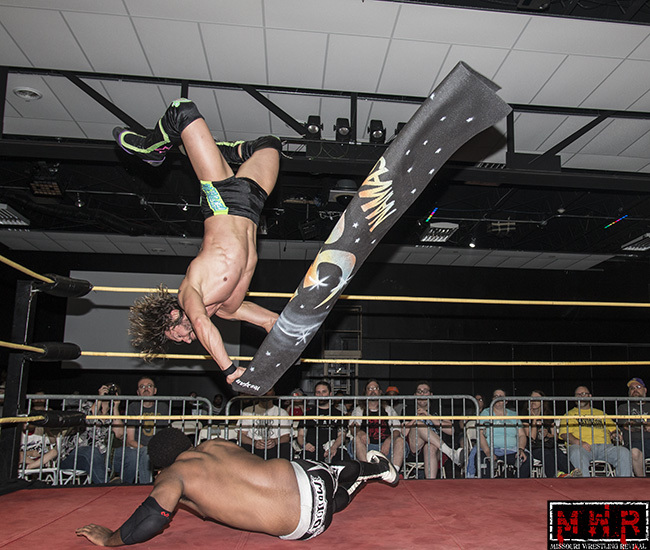 “The King Of Chaos” Ricky Cruz vs. Brandon Espinosa for the MWR Missouri Title: The history between these two runs deep over the past few years, including a brief reign as Dynamo Tag Champs. 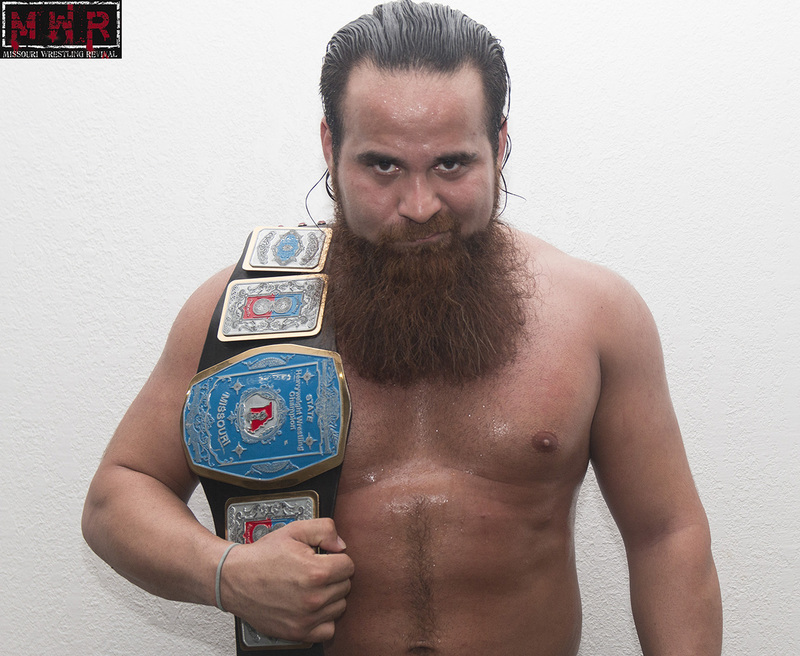 While it’s a source of bitterness for Espinosa that he had to start at the bottom of this promotion and claw his way to the top, Ricky has been a two-time Heavyweight Champion as well as SICW Classic Champion. 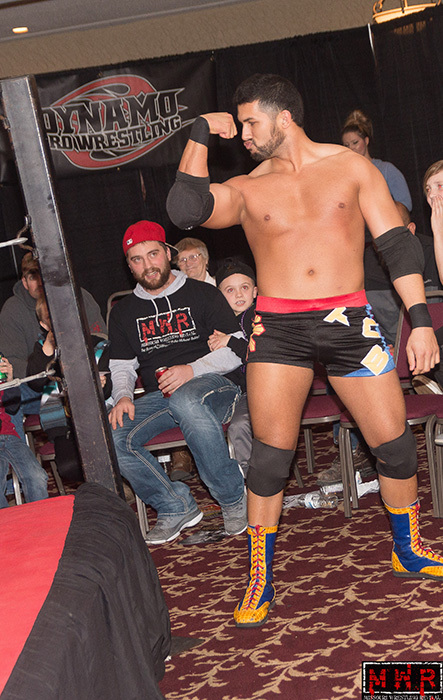 These two had an altercation at the Cinco De Mayo show that led to Cruz pinning Espy in a six-man tag. 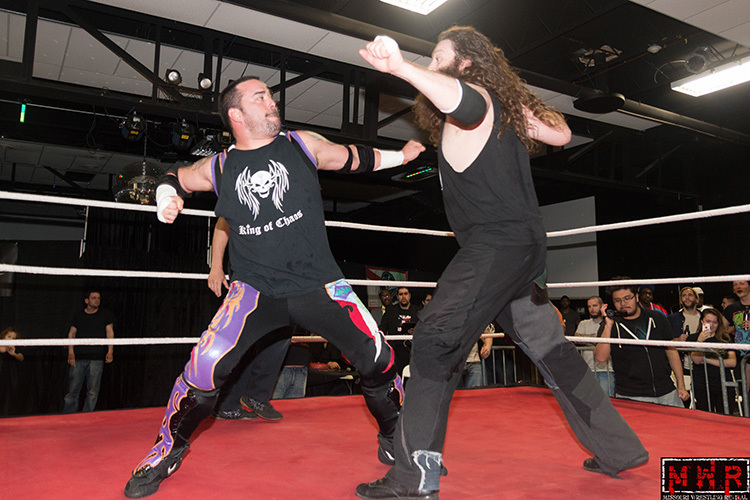 The pre-match promos set up the bout as a sportsmanlike contest between the two, though both men have been known to throw the rulebook out the window. Each guy withstood the best that the other had to offer, including Espinosa surprisingly kicking out after the Cruz Control(swinging fisherman buster). 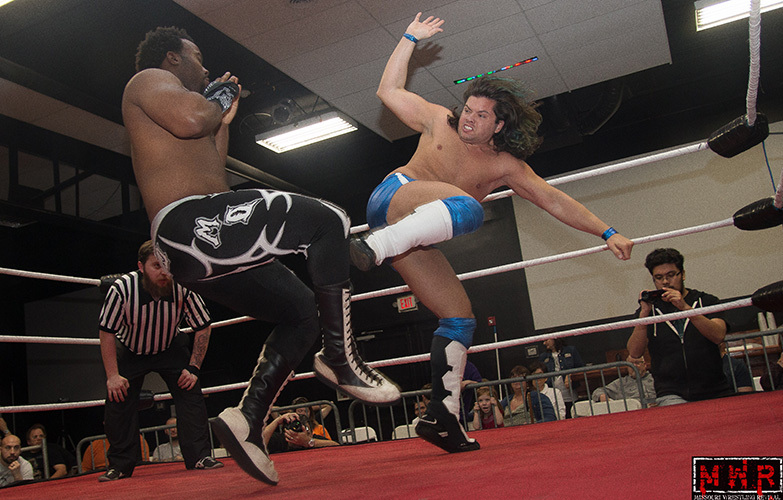 Cruz unloaded with kicks, but Espy ducked the last one and rolled him up for the shockingly clean pinfall in 15:18! Ladies and gentlemen, we have a newwwww MWR Missouri Champion! 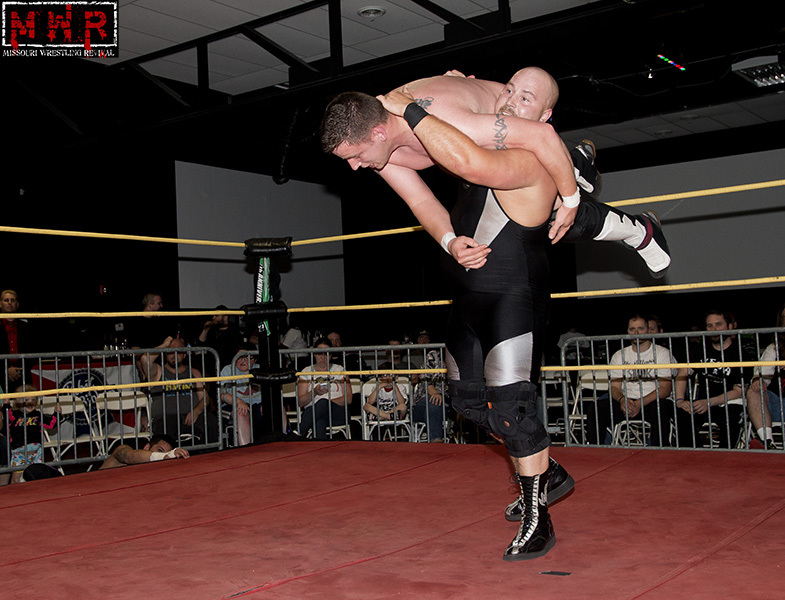 “The Don Mega” Shorty Biggs vs. “Young & Dangerous” Evan Morris: This stemmed from Morris’ turn last weekend as he named Shorty as one of the guys who “held him back” in the days of Metro East Championship Wrestling. 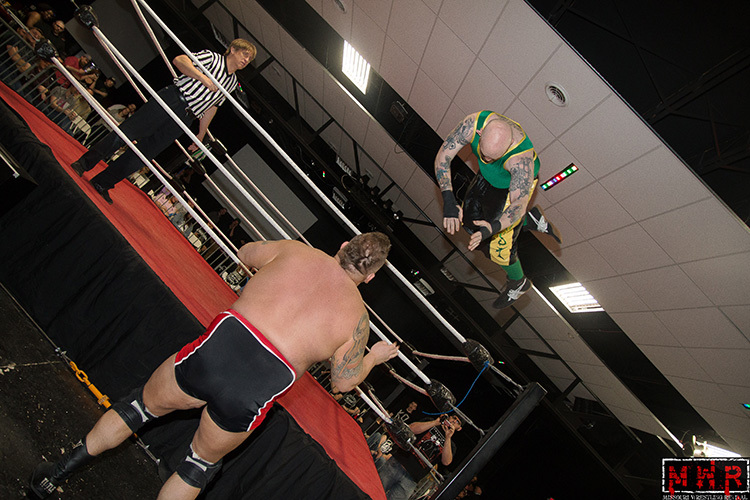 Morris entered with Shawn Santel & Mauler McDarby by his side, so Shorty was accompanied by D-1 Champion Outtkast who ran them off…so that left the match as a one-on-one bout as it should have been. 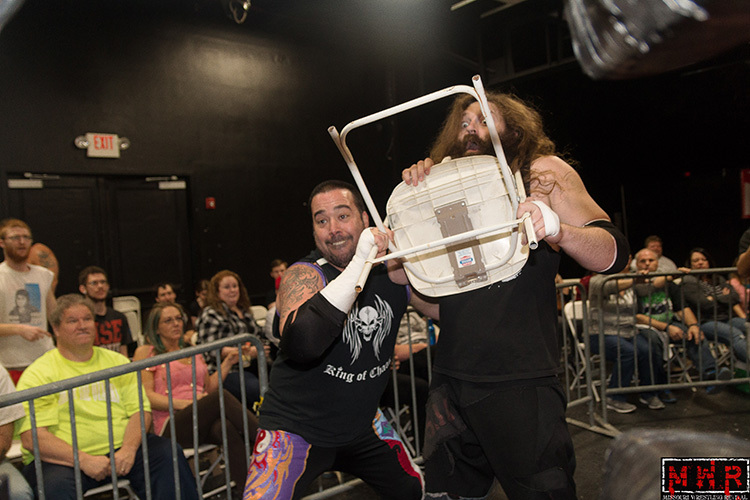 After a competitive matchup, referee Patrick Hook was knocked down(the start of a rough night for him) and Morris brought a chair into the ring. Shorty got the chair away from Morris, but saw the referee was recovering and threw the weapon back to Morris, pretending he had been hit with it. Morris confronted the official and protested that he hadn’t hit Shorty with the chair, but Shorty rendered the point moot by rolling up Morris for the pin in 9:59. 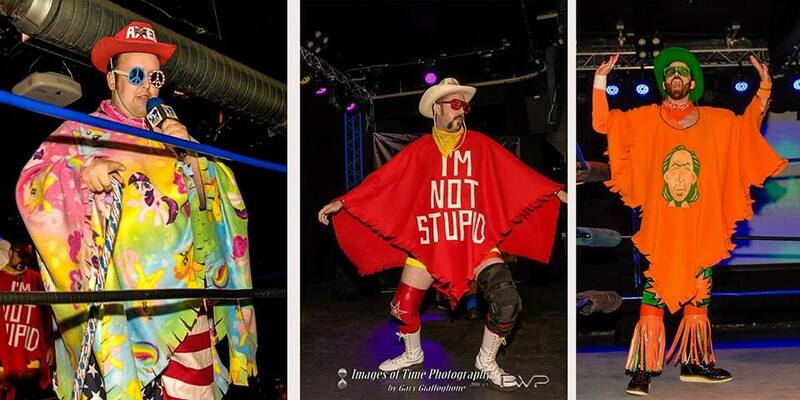 “The Valedictorian” Keon Option, Justin D’Air, & “The Millenial” Danny Adams vs. Brandon Espinosa, “The Filipino Warrior” Elvis Aliaga, & Da’Marius Jones. 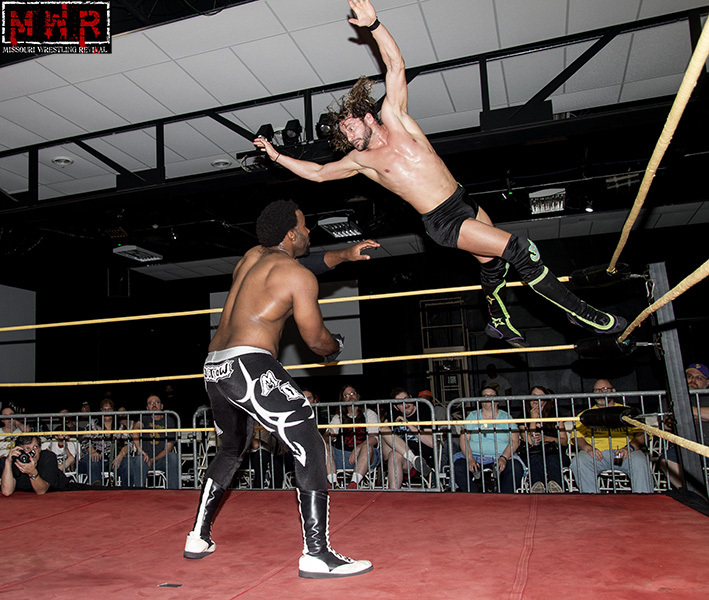 This was a fast-paced encounter that got a lot of time; the highlight move of the match was D’Air delivering an insane senton off the top rope onto a bunch of opponents on the floor! The finish saw the referee checking on the humanity outside the ring, totally missing Espinosa delivering a low blow on D’Air. After that, the brainbuster was academic and Espy got the win in 15:26. 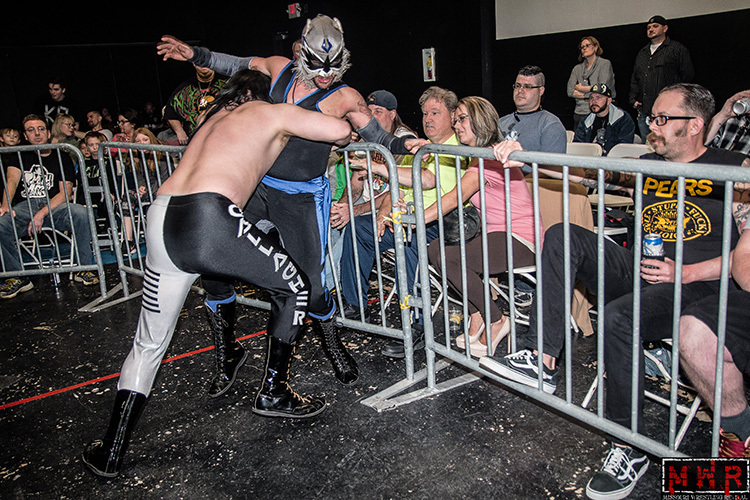 Rocket Mapache vs. “The Alternative” Ozzie Gallagher: Gallagher had another ringside confrontation with Sadie Blaze as their ongoing issue continues; Blaze has been particularly sensitive about Gallagher’s disrespect regarding Rocket’s mask. Gallagher actually stole Rocket’s mask a few months ago, but Rocket reclaimed it with help from his Bite Club partner Jackal. Rocket was motivated in this matchup, but Gallagher kept using underhanded tactics and was obsessed with trying to remove the mask. 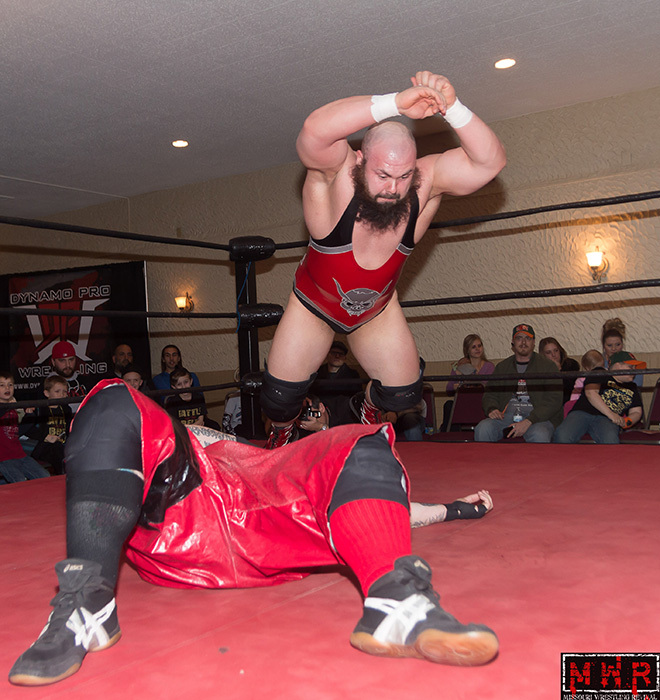 That drew the ire of Blaze in the audience and Gallagher got sidetracked by his war of words with his former mentor. That allowed Rocket to surprise Gallagher with a crossface chicken wing out of nowhere for the tapout in 6:28…but Gallagher attacked Rocket from behind and went for his mask again. 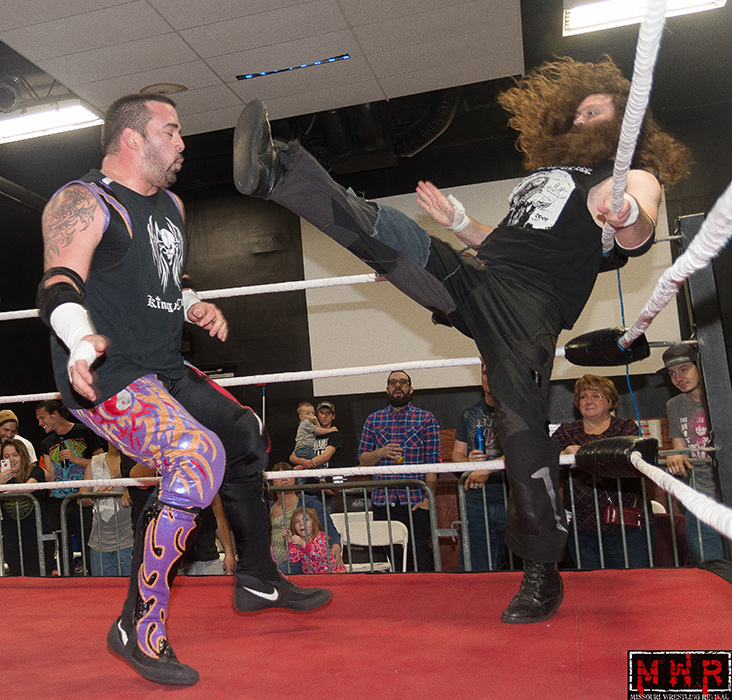 Sadie had finally seen enough and jumped in the ring to confront Gallagher directly…he kicked him in the midsection before delivering a double-underhook suplex to send Gallagher into retreat move. Sadie got the microphone and told Gallagher that he had a friend who knew a thing or two about masks in wrestling…a “Wind Of Destruction” was coming his way. It looks like we may be seeing the return of Makaze in the near future. Jackal vs. C.J. 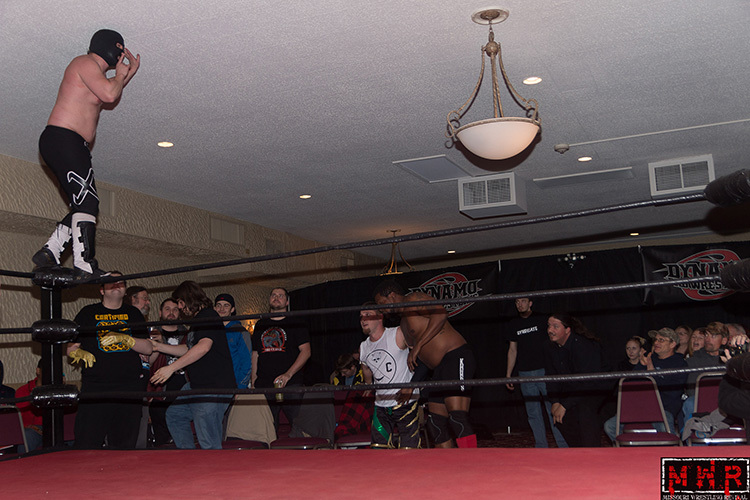 Shine: Shine danced his way through his ring entrance and got a good reaction from the fans, but he wasn’t likely to beat out the longtime favorite Jackal in the popularity department. 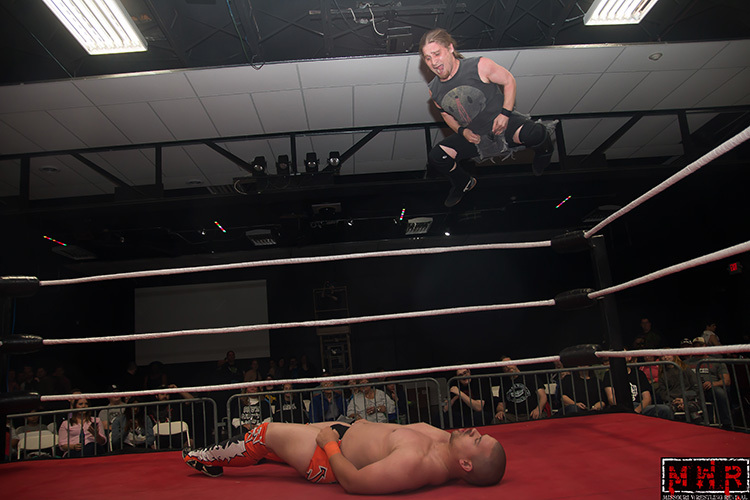 Shine had a competitive showing, one of his best to date, but Jackal picked up the victory with a frog splash in 5:55. 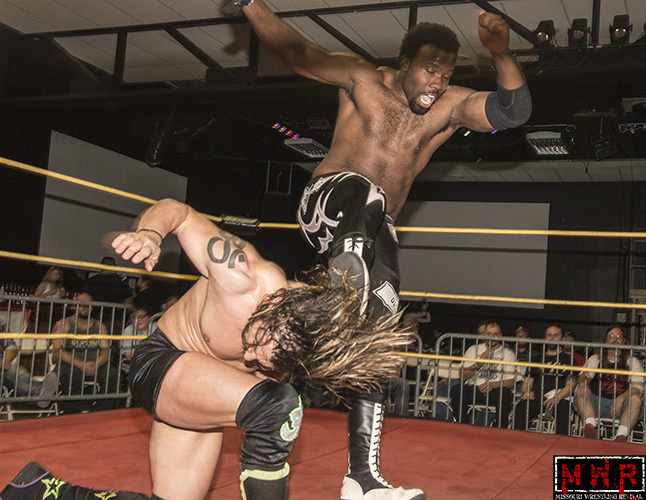 Mike Outlaw vs. Brandon Aarons: This promised to be a competitive battle between two of the top-ranked wrestlers in the Midwest. 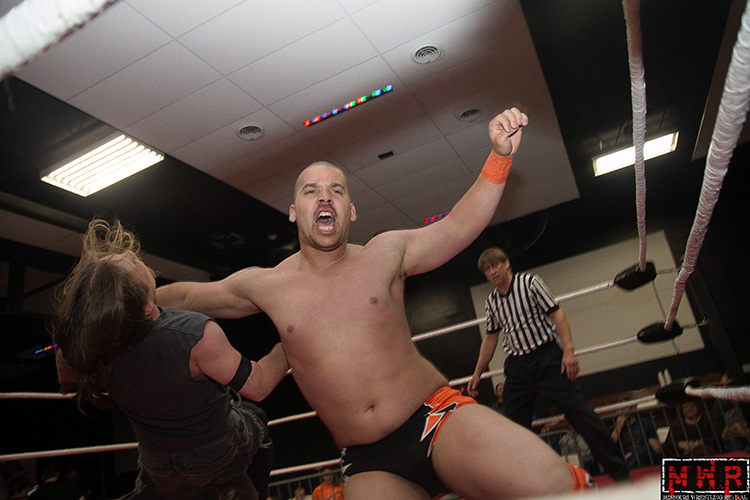 While it was a battle of fan favorites, Outlaw made some uncharacteristic moves such as attempting a pinfall with a single knee on the chest. Considering his change of attitude in alternate universes, I wonder if that’ll influence his character under the Dynamo banner? 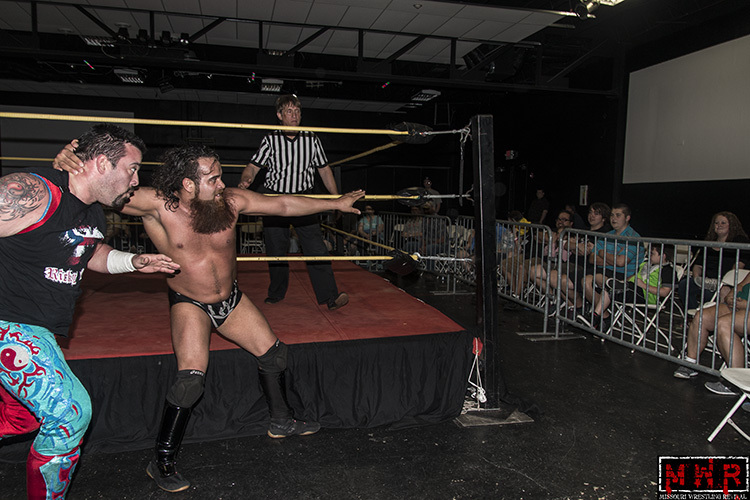 The match could have easily gone either way and Aarons appeared to have the momentum in his favor, but recent rival Kevin Lee Davidson made his way to ringside. 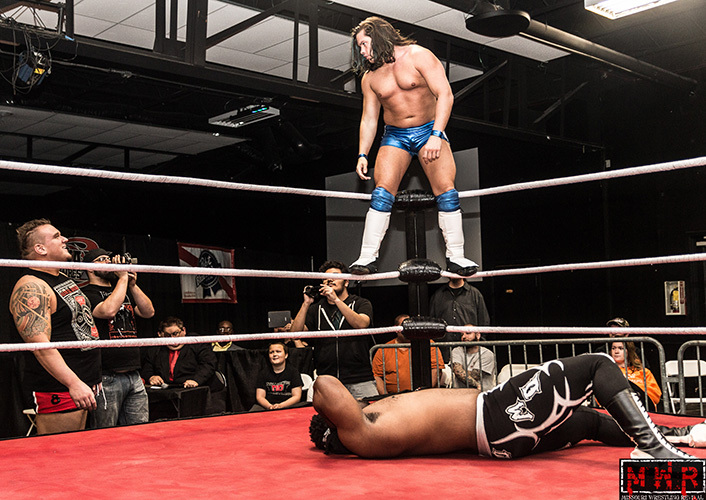 That distracted Aarons as he ascended the turnbuckles, giving Outlaw enough time to roll out of the way of the incoming double-stomp from the top rope. 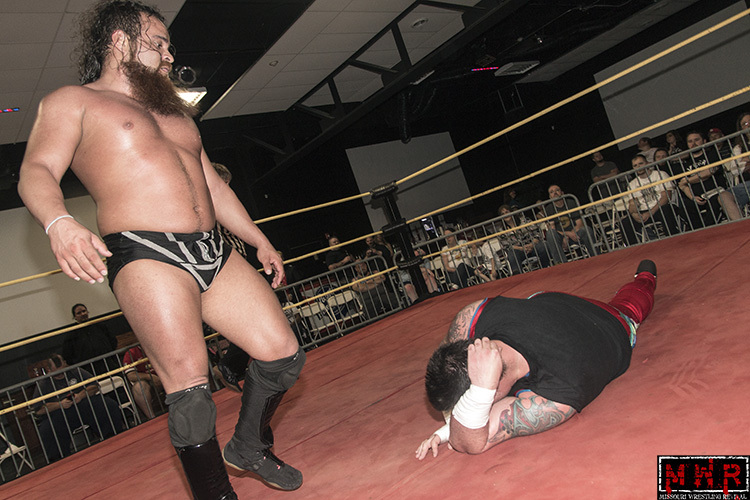 Outlaw delivered the Mafia Kick and that was enough to edge out the win in 9:24…despite the outside influence on the result, the two shook hands after the match was over. 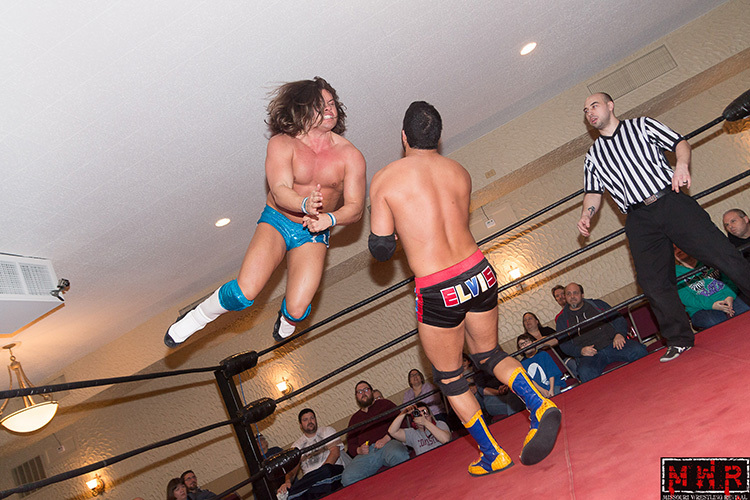 High Level Enterprise (Jack Gamble & Jon Webb) vs. The Professionals (Shawn Santel & Mauler McDarby) for the Tag Team Titles: On the heels of retiring Eric Allen at the previous week’s Wood River show, Santel & McDarby finally had their shot at the belts. They were really good foils for the flashier style employed by Gamble & Webb; I would compared them to NXT duos like Wesley Blake/Buddy Murphy and Scott Dawson/Dash Wilder in that regard. While it looked like the champs were on their way to another successful title defense, the official was knocked down…this was just NOT Patrick Hook’s night. Santel brought the shillelagh into play and, despite a near-miscue, managed to coldcock Webb with the weapon. That brought Gamble to the rescue, but the rulebook was out the window with the referee down and out. Gamble got a hold of the weapon and hit Santel with it, but McDarby had a backup plan: Brass knuckles! He took Gamble out of the game with the knucks, then dragged the dazed Webb to his feet for a totally graituitous shot with the knuckles. 1-2-3 and we had NEWWWWW Tag Team Champions in 8:48! The titleholders took some time to gloat, then ran like the proverbial thieves in the night when Gamble & Webb gave chase…tremendous. Outtkast vs. Kevin Lee Davidson for the D-1 Title: K.L.D. had been impressive and just got back from a successful tour of Europe. 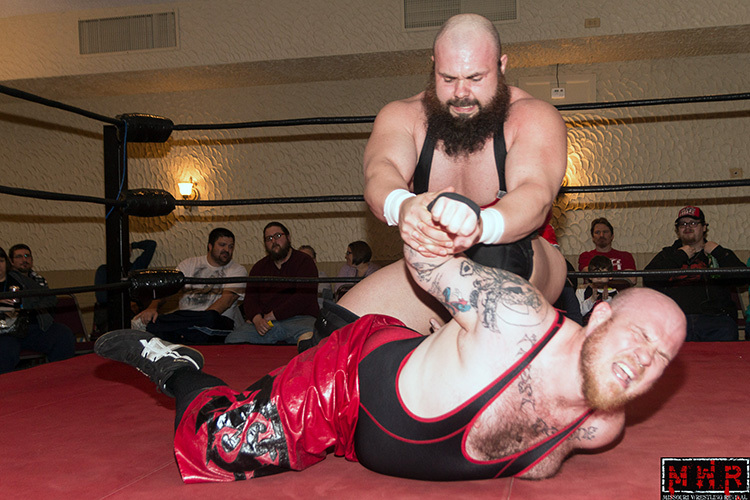 He’s held titles in the Mid-Missouri Wrestling Alliance and is the current Heavyweight Champion of Wrestling Invades America. 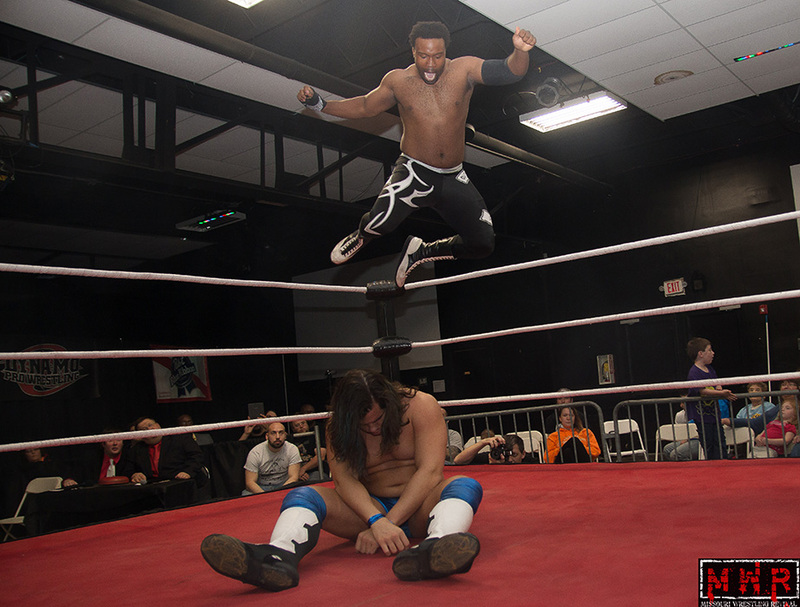 Outtkast had to go aerial a bit more than usual due to the size difference, including his corkscrew moonsault dive from the top rope to the floor. He had trouble hitting his signature moves, though he did manage to deliver the Lost Cause (fireman’s-carry spinebuster) for a near-fall. K.L.D. nearly won a few times, but his second attempt at a corner cannonball missed the mark and Outtkast rolled him up for the pin in 9:24. 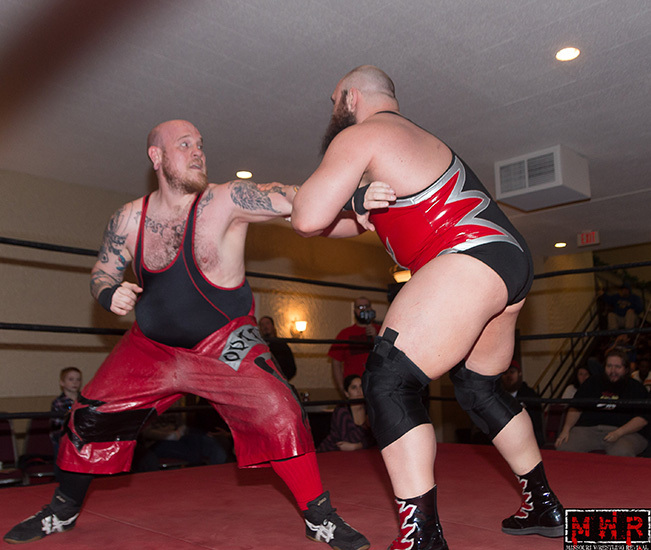 “Dirdey” Jake Dirden vs. “The King Of Chaos” Ricky Cruz for the Dynamo Pro and MWR Missouri Heavyweight Title. 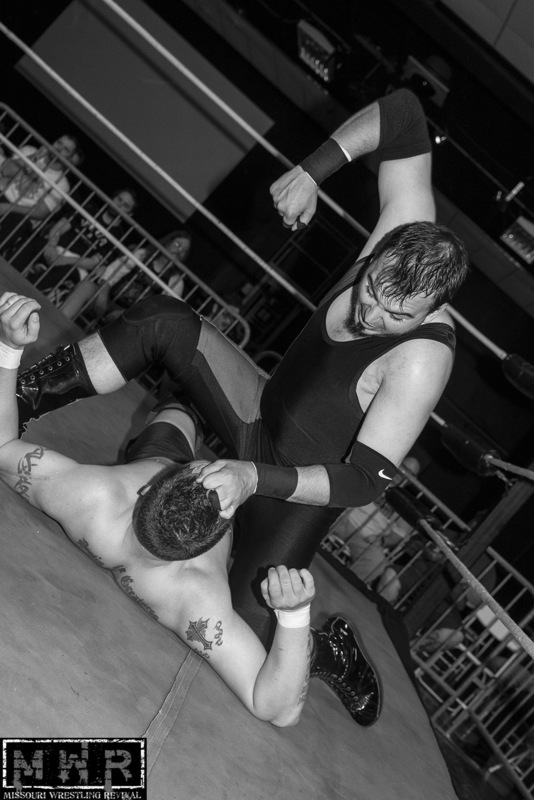 This didn’t take long to get out of hand as they fought out of the ring and brawled all over the building…Dirden rammed Ricky’s head into the wall and left a hole! They fought toward the merchandise tables and Cruz threw Dirden over the main table…thankfully they more or less spared the MWR table and my fries and soda. 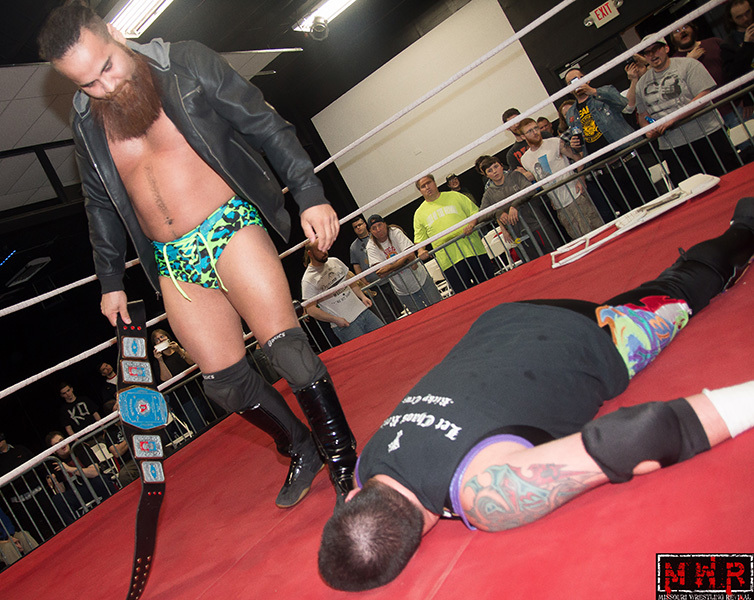 They eventually made it back to the ring as the referee allowed some leeway, but Brandon Espinosa decided to get a closer look at the action…and both title belts at ringside. The fight spilled out of the ring AGAIN, leading to Cruz decking Espy when Dirden moved out of the way. The fight continued and both guys traded signature moves…Cruz hit the Cruz Control(swinging fisherman buster), but Espy pulled the ref out of the ring. The ref called it a DQ win for Cruz in 13:36…but things were far from over between these three. Dirden gloated that Cruz would NEVER get another shot at his title…and Espy added injury to insult by attacking Ricky from behind with a chair. After all of that,Cruz declared that if Dirden wouldn’t give him a title shot, he may just have to make sure Dirden doesn’t hold the title for much longer. 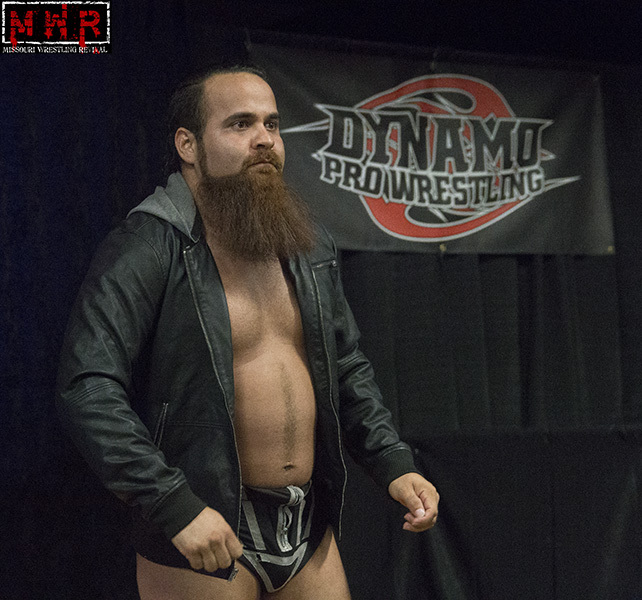 Dynamo Pro Wrestling returned to the Stratford Inn in Fenton, Missouri for another great night of action…it would be an eventful evening in more ways than one. The night started with “TNT” Keny G speaking to the fans about his upcoming benefit show for stroke victims. 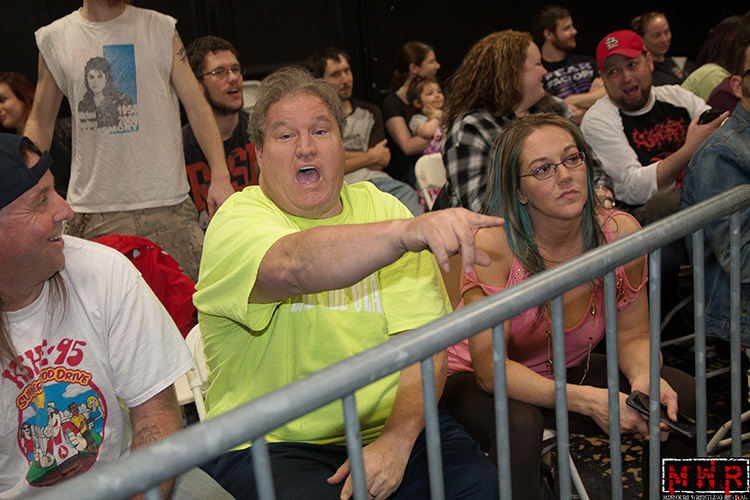 Keny recently suffered a stroke himself and wanted to bring the St. Louis wrestling community together for a good cause. 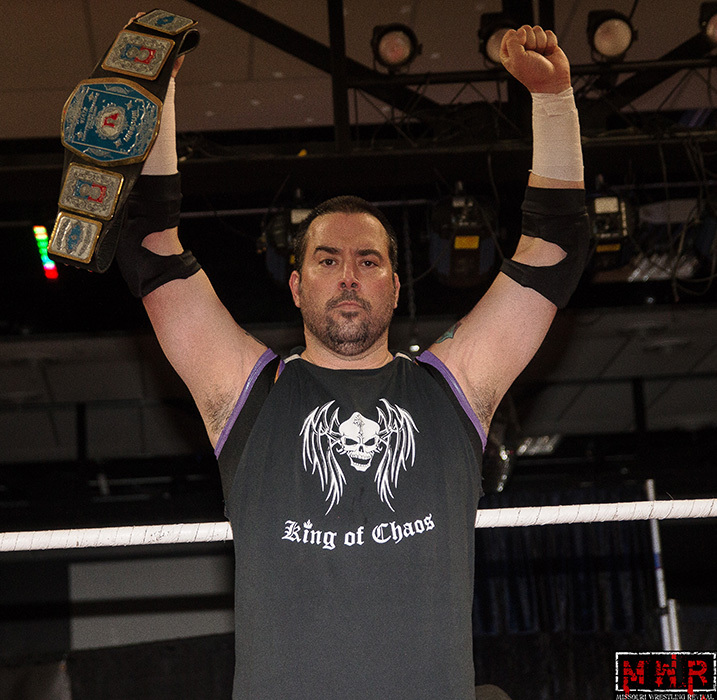 After that, MWR’s own Brian Kelley presented two of the year-end awards for 2013; Alexandre Rudolph received one of the “Future Star” awards and Lucy Mendez was crowned “Sexiest Female Wrestler” of the year. The first match of the night saw a battle for tag team supremacy…each duo in the triple threat match had the winner of the night’s Tag Team Title match in their sights. 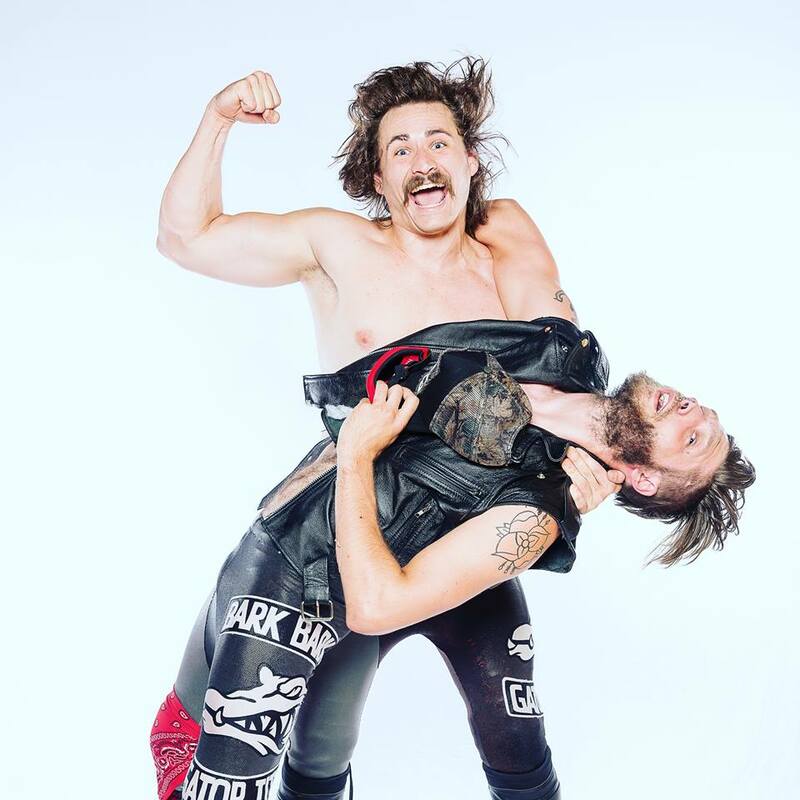 The seemingly mismatched duo of Evan “Money” Morris and “The Littlest Viking” Jake Parnell worked surprisingly well together over the course of the bout. 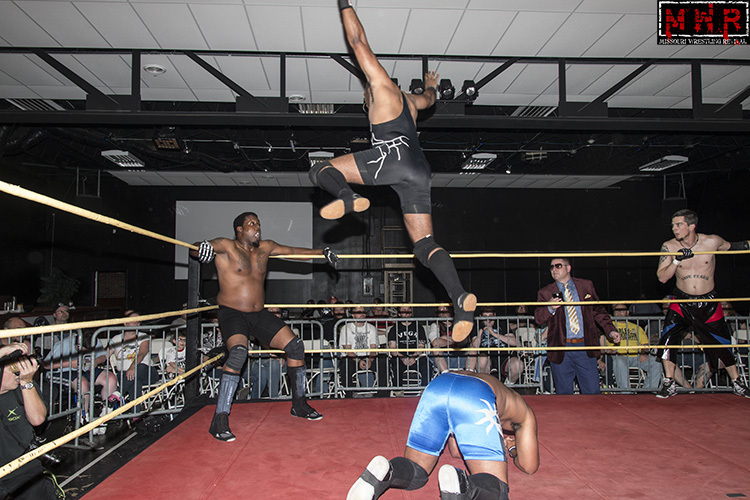 High Level Enterprise(Jack Gamble & Jon Webb) seemed to be on the verge of victory, but a miscommunication between the two led to The Elitism(Brandon Espinosa & Ace Hawkins) picking up the win. 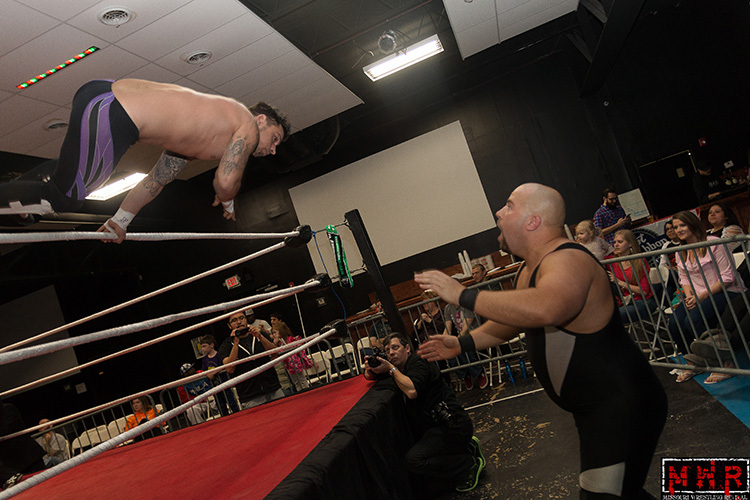 Ricky Cruz(now accompanied by Lucy Mendez) got into a verbal altercation with Executive Director Mark Bland over his lack of title shots…Bland told him to work his way up the ladder if he wanted another championship opportunity. Ricky had a tough test in the form of the returning Brandon Aarons, but Lucy’s distraction led to Cruz scoring the victory. Dan Walsh hoped to get back on track against “Showtime” Bradley Charles, but Brandon Gallagher stuck his nose into Walsh’s business once again. While “The Alternative”‘s attempt at interference backfired, “SBC” was still able to surprise Walsh with a TKO to beat the former Dynamo Champion. 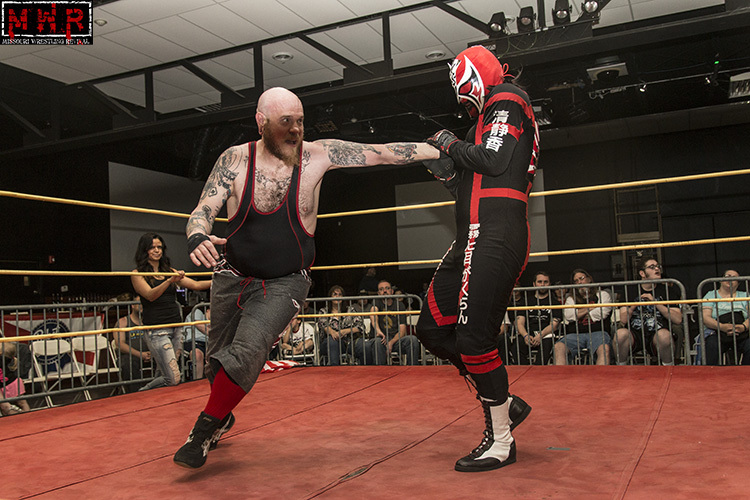 Walsh nearly got his hands on Gallagher, but his blue-haired nemesis got away…leading to Walsh challenging him to a match at Dynamo’s return to Glen Carbon. 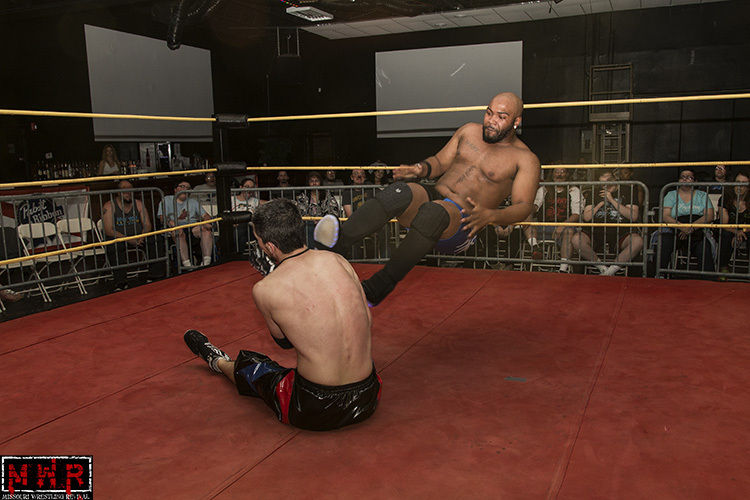 Elvis Aliaga hoped to earn his way back into title contention against Mark Sterling; it seemed like Sterling’s Crossfit experience would give him the conditioning to outlast the current WLW Champion, but Aliaga was able to escape with a quick crucifix pinfall. 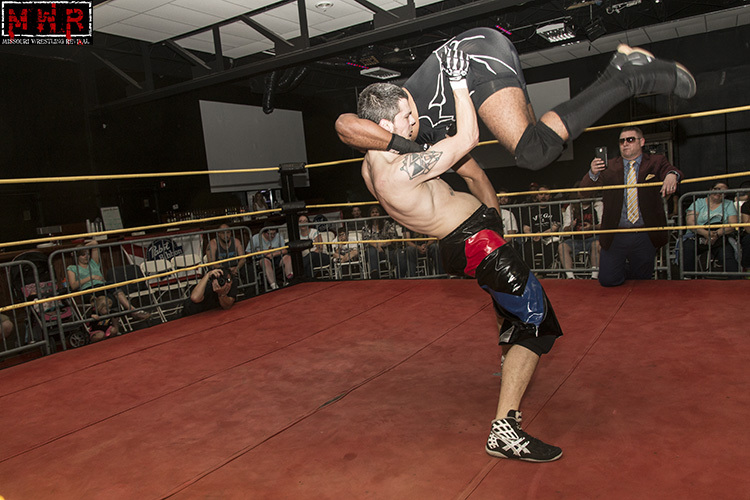 Powerhouses clashed as “The Urban Legend” Kevin X locked up with Alexandre Rudolph. “The American Viking” gave the veteran a good fight and Kevin X barely edged out a win with a small package. 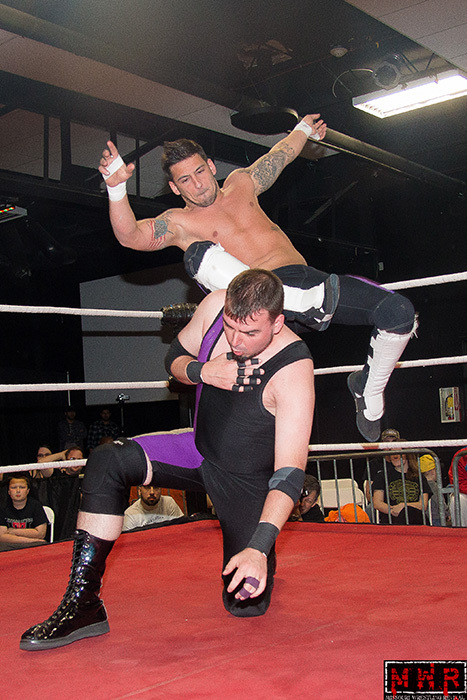 Brian Kelley presented the 2013 MWR Wrestler Of The Year award to Dynamo Champion Jake Dirden…Jeremy Wyatt took the opportunity to attack Dirden from behind, hitting him with the plaque and laying him out with the Lightning Spiral. 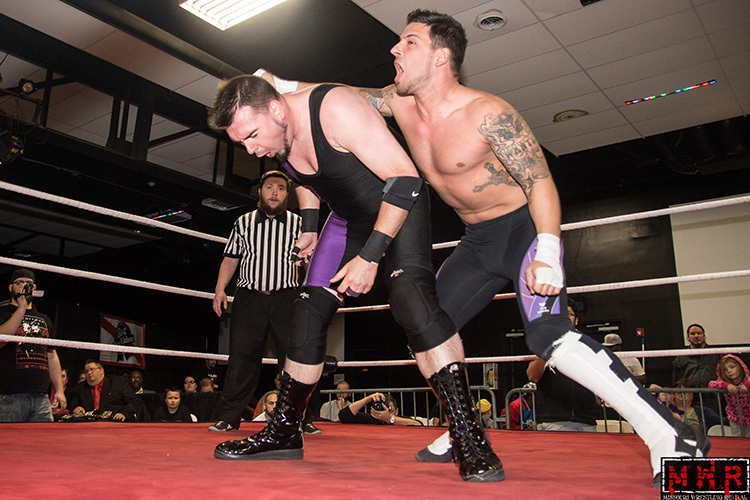 Dirden was able to return to the dressing room under his own power, but Wyatt had scored an early advantage in their rivalry. 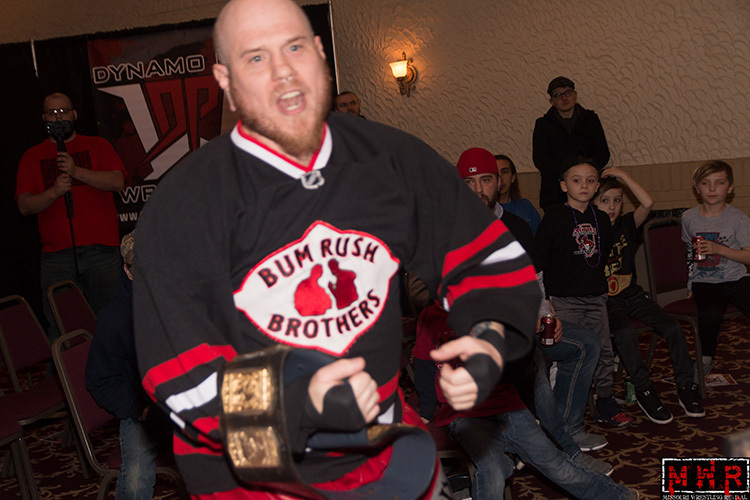 After being robbed of the Tag Team Titles in February, The Bumrush Brothers(Shorty Biggs & Outtkast) were fired up to reclaim what was once theirs. The Black Hand Warriors(Michael Magnuson & David DeLorean) were confident under the guidance of manager Travis Cook. The momentum swung back and forth between two of the top teams in the Midwest…but the match broke down into a huge brawl at the end. 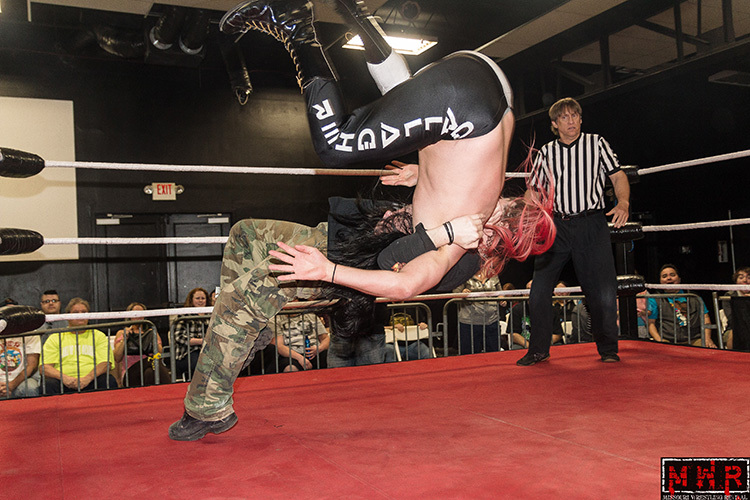 In the confusion, Magnuson accidentally knocked down his manager Cook…the BRBs pounced on their advantage and hit a double-team faceplant on DeLorean. 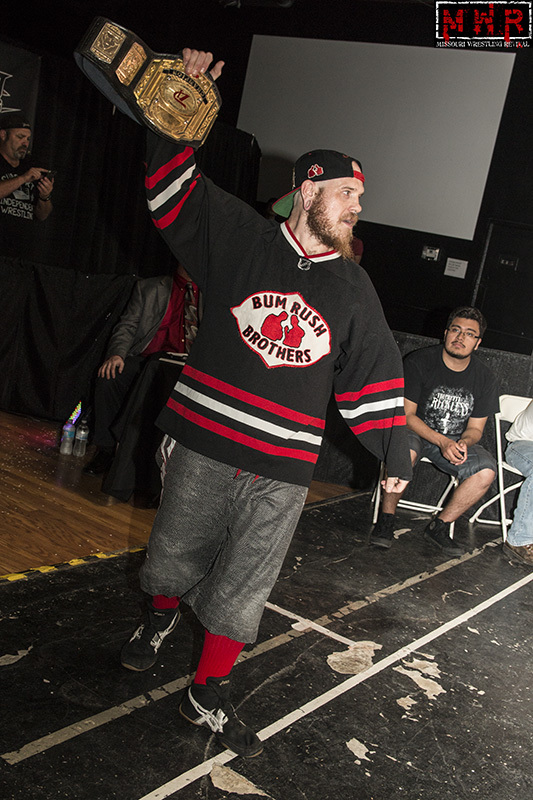 Shorty got the pinfall and the Bumrush Brothers were two-time Tag Champs! The fireworks didn’t end there…as Shorty and Outtkast celebrated their win, they were jumped by Mauler McDarby and Shawn Santel! 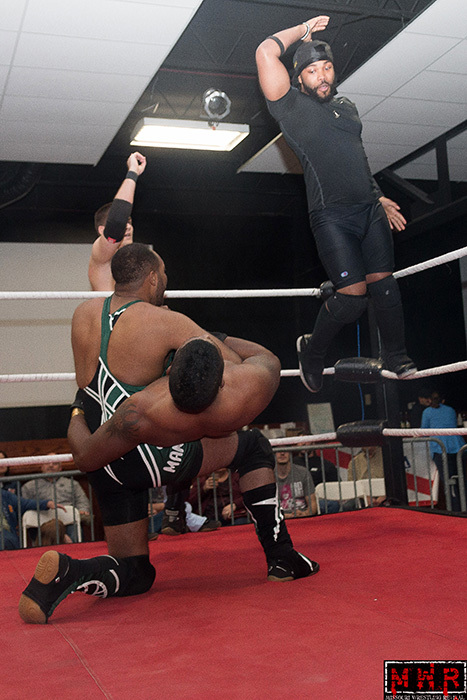 The duo had been observing the show from the audience and took the opportunity to do some damage to the new titleholders…as security ejected them from the building, the Warriors looked for some post-bell retribution until Jack Gamble and Jon Webb appeared to run off their rivals! Dirden was fired up to avenge Wyatt’s earlier beating as the Dynamo Heavyweight Title was on the line. Wyatt had the clear edge in experience, but Dirden had a ton of momentum on top of his size and power advantage. 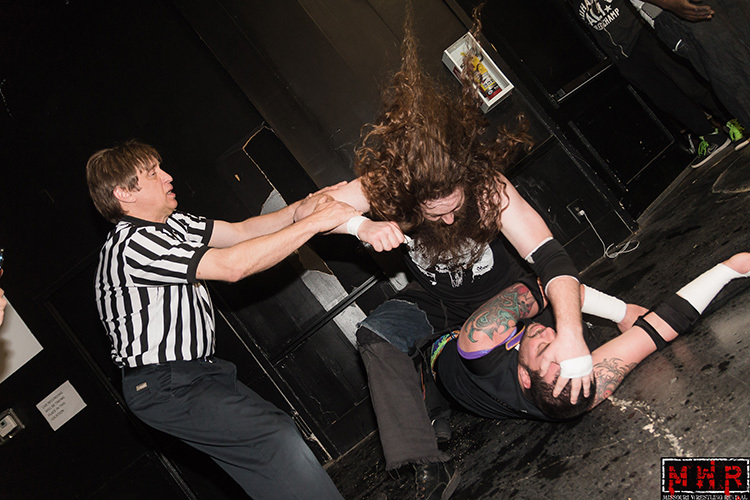 In the heat of the battle, referee Jay King was knocked down when Dirden attempted to powerbomb Wyatt into the turnbuckles…Dirden caught Wyatt in his Asiatic Spike hold but there was no official to see the tapout. 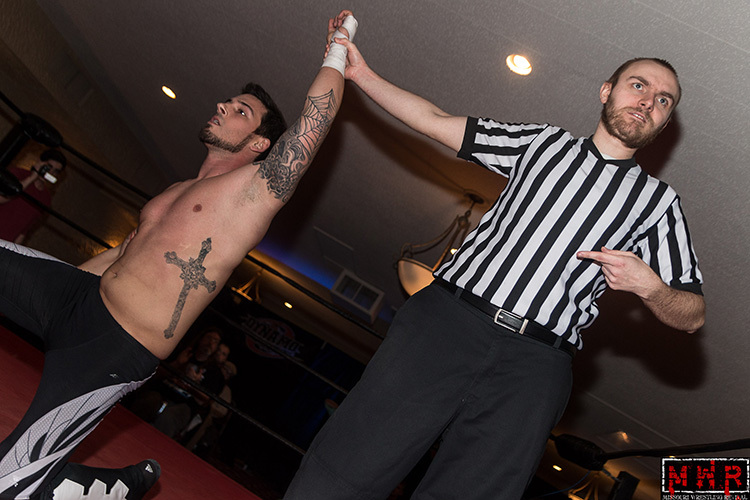 Wyatt capitalized by decking Dirden with the title belt…he made the pin cover and referee King counted three! It looked like the Dynamo Title had changed hands…but Elvis Aliaga ran out to protest the decision, telling Jay King what had happened when he was down on the mat As a result, the ref ordered the bout to be restarted…Wyatt thought he had added another belt to his collection but it was not to be. In the end, Dirden’s power made the difference as he chokeslammed Wyatt to the mat for the win to retain his championship! Dirden was the winner and Wyatt immediately blamed the loss on Aliaga, sparking a fight between the two…what was Aliaga’s motivation? Was he ensuring that Dirden hung onto the title so he could be the one to take it from him? Dynamo started a busy month at the Stratford Inn in Fenton…and things promise to get even more exciting as Dynamo returns to Glen Carbon and Off Broadway in the next coming days! 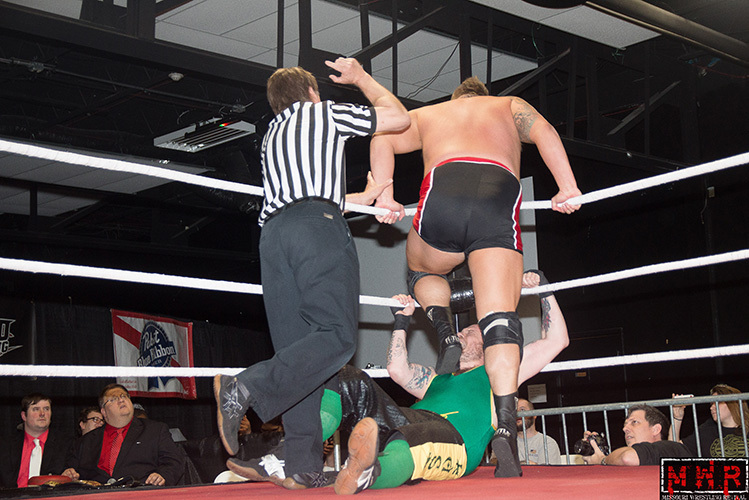 Last Month we made our way back to MECW in Wood river Illinois for a great night of wrestling. A fun filled card with two men that has to be mentioned as MWR Wrestlers of the Year for 2010 Bailey Mannix and Eric Allen. 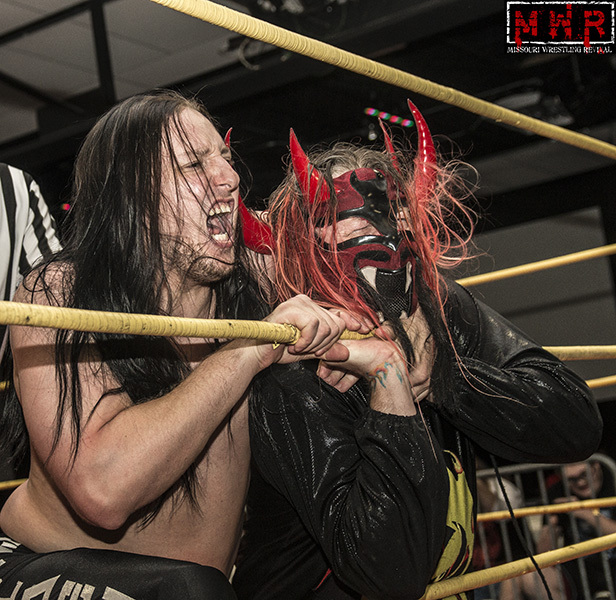 These two have been friends at times but the desire to be the MECW Championship has been too much for them to maintain the good feelings in the ring. One of the most entertaining duo in the game is the MECW Tag Team Champions Jordan McEntrye & Knight Wagner otherwise known as Bromance. Led by the vixen Eryn they look to hold onto the titles for a long time. 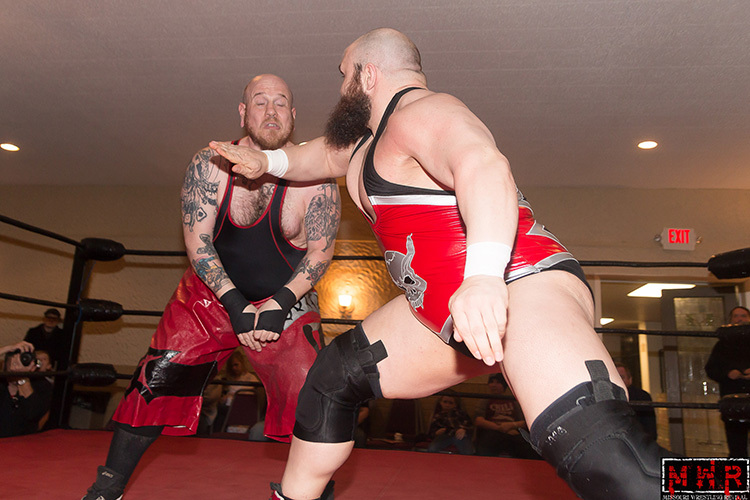 Their biggest test to date is the Bowery Brawlers , consisting of Maddog McDowell and Mauler McDarby. Can Bromance keep this young team at bay? 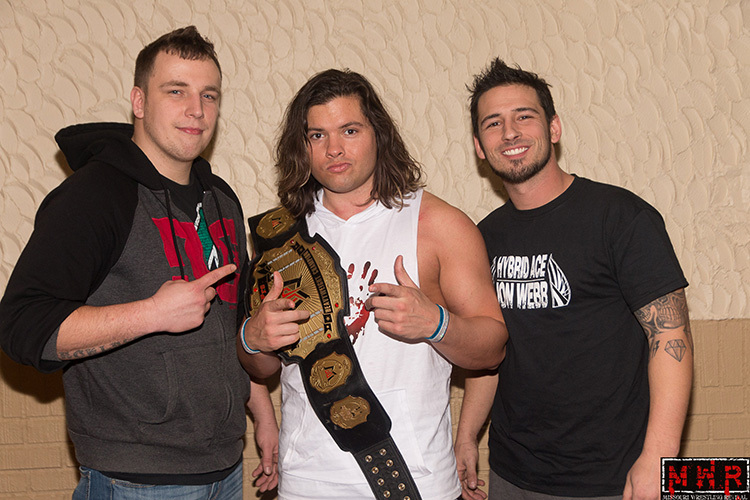 For the first time I was on hand to see the new MECW Independent Champion Ricky Kwong led by his manager Chad Mylan. Mylan has been a handful at 3XW in Iowa and the drive all the way to Illinois has not calmed the eccentric manager. 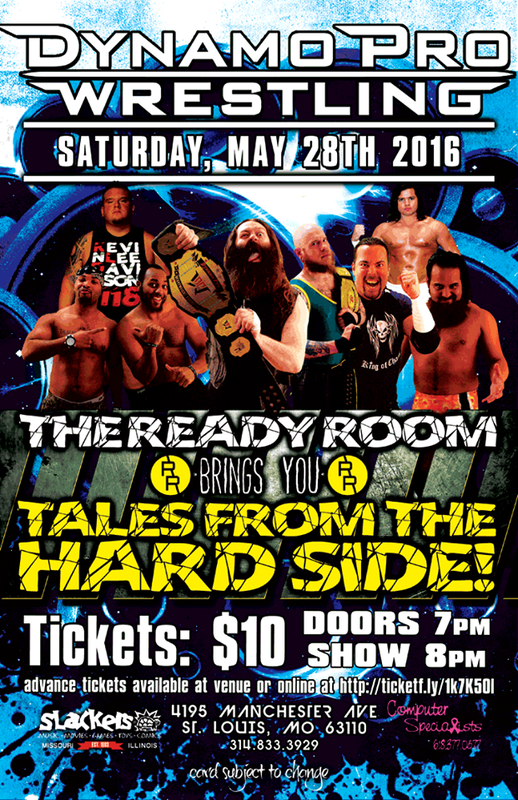 Can former champion Gabriel Brimstone or fan favorite Jimmy Rockwell spoil Mylan’s plans to take over MECW? 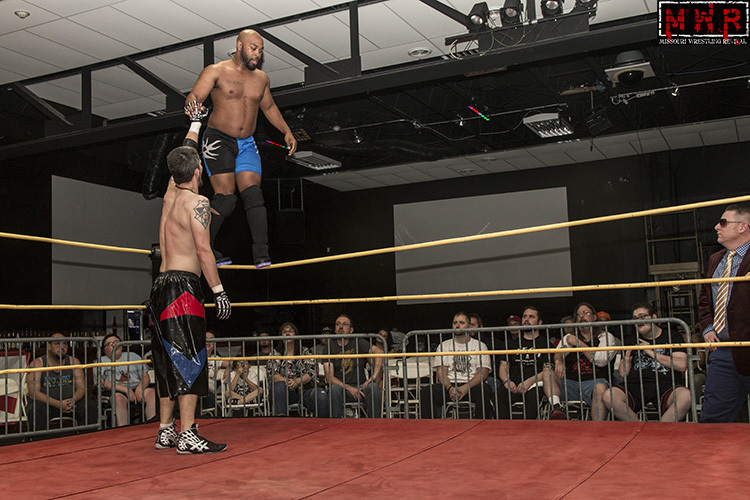 Chris L.O.G.A.N has been very impressive in his short time at the MWR coverage area, taking on the likes of Mannix and Tony Kozina. He is able to over power you and punish you with multiple suplexs. Look for big things to come from this man. Sarin Sinn brought in some muscle from Chicago with the debut of Mike Anthony. 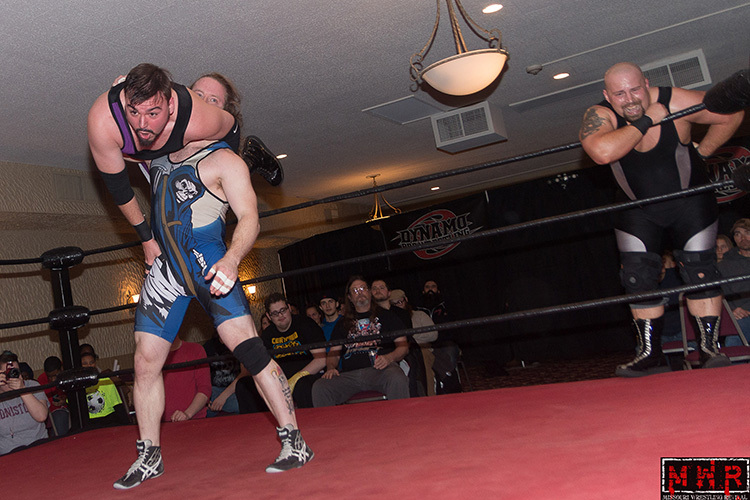 What will the veteran Anthony have in mind for his future at MECW? Can the Youth sensation Evan Money rebound after coming up short last month in his bid for the MECW Title? 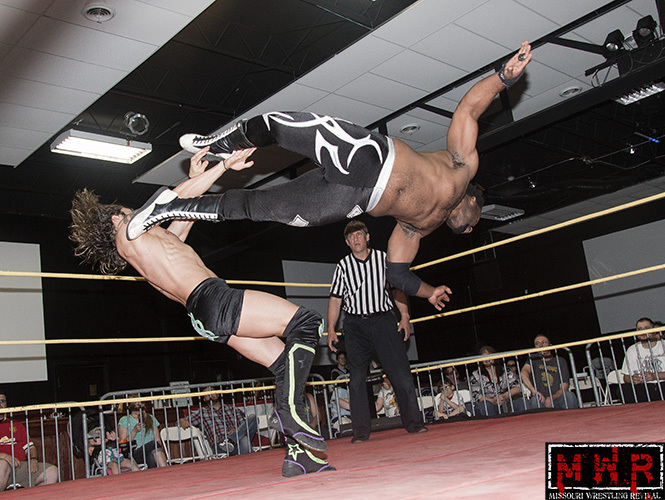 This and much more is why you should check out MECW in WoodRiver on October 23rd. For a full look at all the pictures from this exciting show click here.